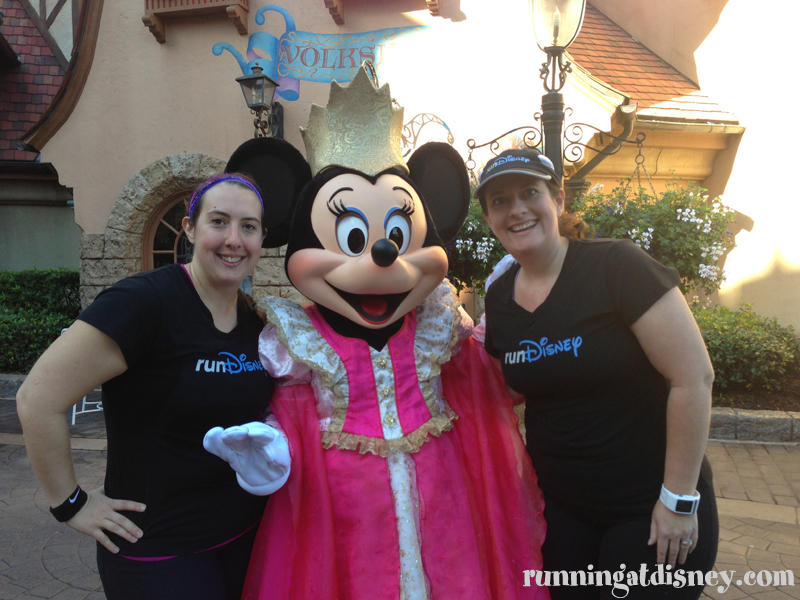 On The Road To Disney Parks: runDisney Visits Atlanta! 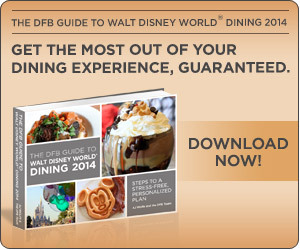 I’ve been a HUGE fan of the Be Our Guest Podcast for at least 4 years now. 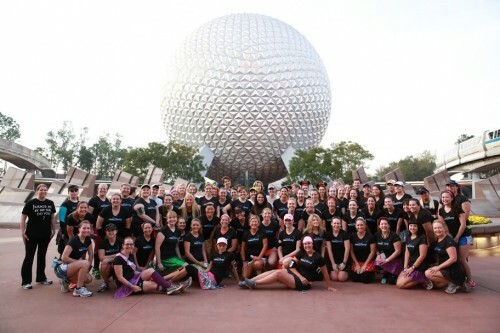 Not only is the show a great way to fill that Disney void between trips, but the community is like nothing else! 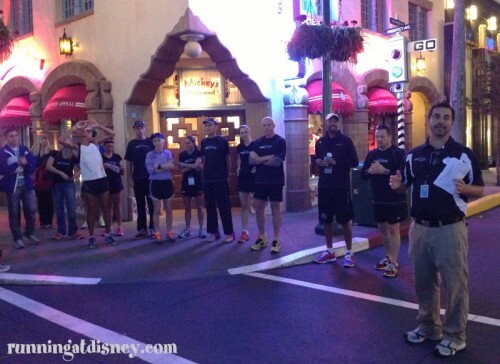 Everyone is beyond friendly and supportive, and there are a bunch of runners in the community as well! So when I saw that one of the hosts of the show, Rikki Niblett, was lucky enough to get into the first runDisney Meet Up on the road in Atlanta, I reached out to her to see if she’d cover the event for RAD. I’m so glad she agreed because she wrote up this awesome recap of the event. 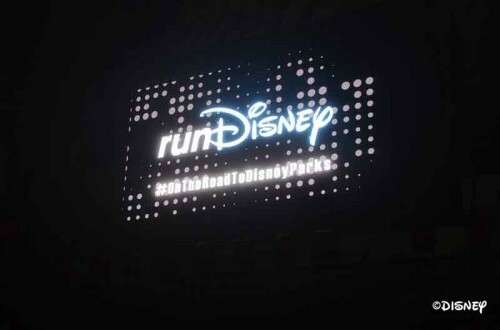 This got me so excited for future runDisney events around the country! Take it away Rikki! So, I bet you’re asking yourself…how did this non-runner get signed up to attend the first stop in the runDisney On The Road To Disney Parks Atlanta meet up? For that story, we have to go back two years ago, back to 2011. 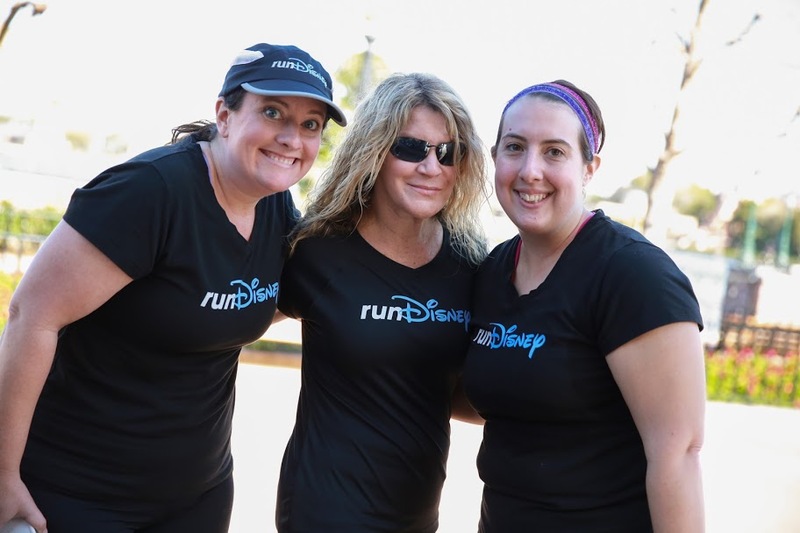 You see, a friend of mine’s daughter was supposed to run the (then) Disney Halloween 5K, which was tied to the Wine and Dine Half Marathon. With no training, what-so-ever, I said I would run it, did so, and thus started my running relationship with runDisney. 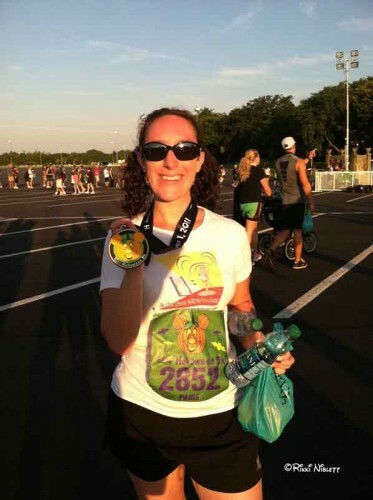 I hadn’t done a race since then, at least until this past July. My best friends are all runDisney participants, so when we were all onboard the Disney Dream, they wanted to run the Castaway Cay 5k. I begrudgingly got up early to go run around the island. Run…heck…I walked it…came in last, but I still got my medal! 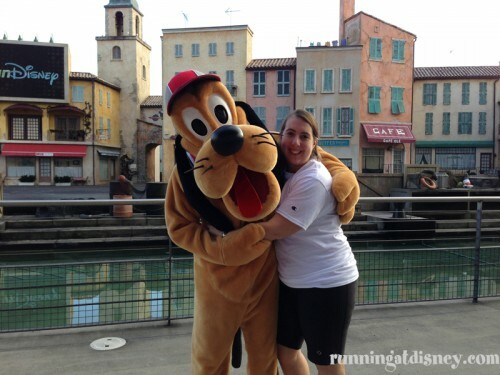 So, here’s this non-runner that’s now two runDisney events. Which brings me to a couple of weeks ago. 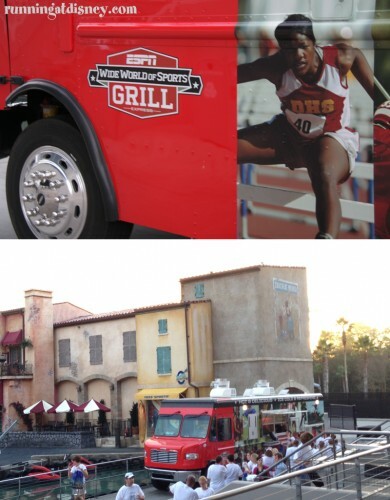 My one bestie told me that she’d seen that Disney was going to bring their first ever On The Road To Disney Parks events to my city, Atlanta! 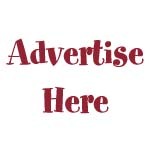 I decided to stalk the website with every intention of just signing up my husband. Once we sent his email off to be entered to be chosen for the event, I thought about it and decided…you know…it’s only two miles…I’d just done three a couple of months ago…I should sign up too. So, I did. A few hours later, the list of names was announced and we were both on it. Which is when panic mode set it. Um…I was going to have to do this two mile fun run. So, I logged onto my Pinterest account where I’d recently and ironically saved information on the Couch To 5k method. I better start “practicing,” as I like to call it. So, out I went, every day for practice runs. I went from someone who could barely run 2 minutes to being able to get in 7 full minutes of running right before the event took place! I’d officially run a little over a mile in my neighborhood during my practices and…I was kind of liking it. I was ready for the event! 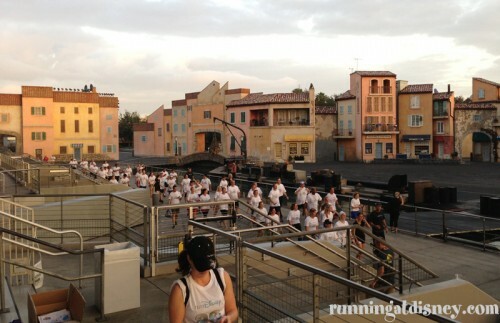 The On the Road To Disney Parks event took place on Saturday, November 16. 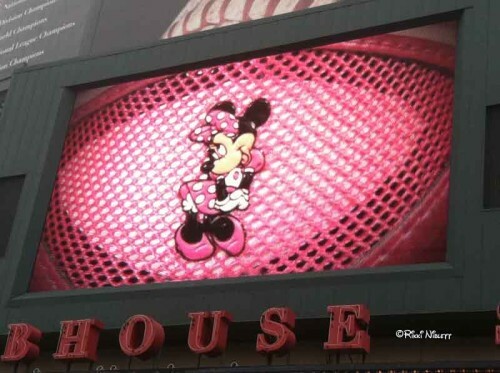 My husband and I got super up early and drove down to Turner Field, where the Atlanta Braves play. Check in started at 6:15 am and as soon as we walked in, we could see the large runDisney logo emblazoned on the video screen. We checked in, got our shirts with the awesome logo on the back and waited, snapping pictures and meeting up with friends, both new and old. 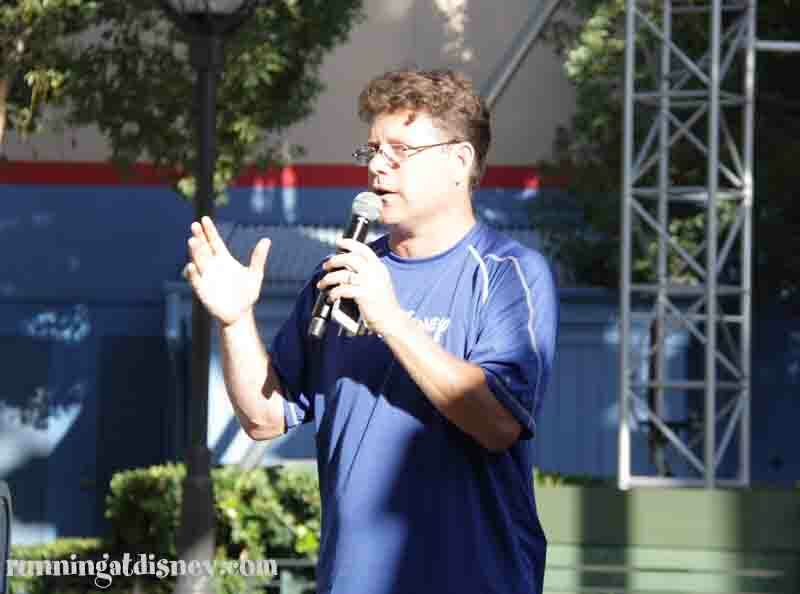 The event started off with an introduction from Michael Cain, who represented the ESPN Wide World of Sports. 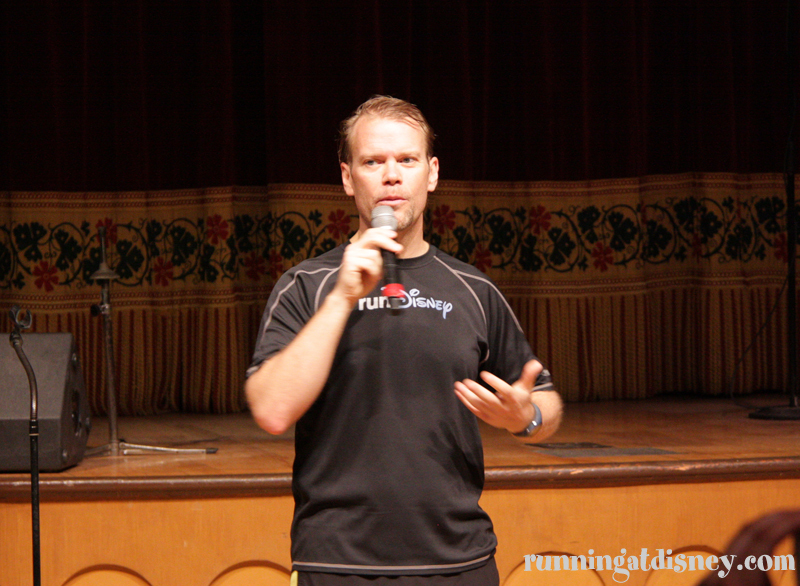 Then we learned about Good Form Running from Brian with New Balance. 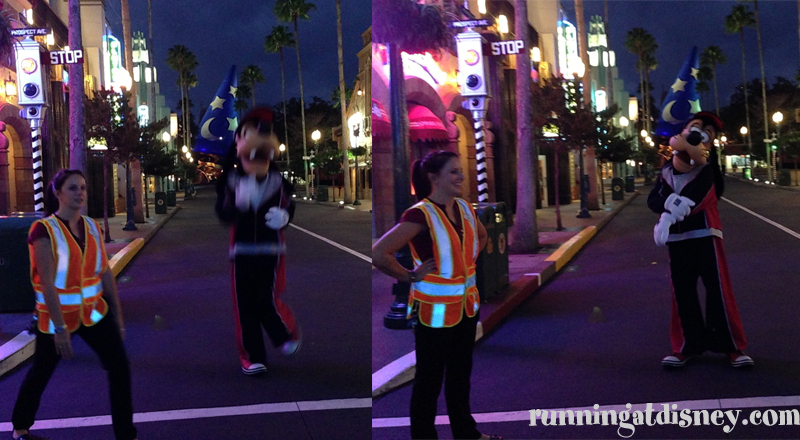 After that, Mickey Mouse came out to help cheer us on as it was now time to run! Despite how hard the running ended up being for me, I had an absolute blast! It was kind of a chilly and foggy morning, but none of that mattered once we got on the road! 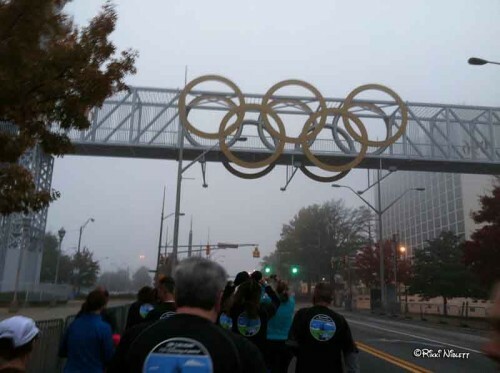 We started by running through the streets of Atlanta, going through a portion of the area that was used in the 1996 Olympics and past the Olympic Rings (with an Olympian! Crazy!). We then made it to the Capitol building, running all around it, then circling back to Turner Field. 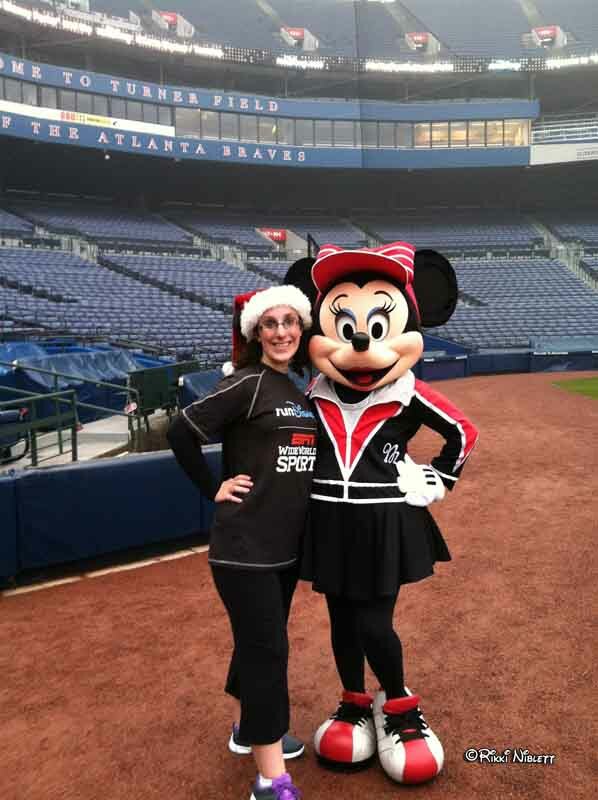 Once we made it into Braves country, we started to run inside the stadium, through the back tunnels. This was fun! Then, we turned a corner and saw the light, literally, as we could see our path lead us to the field. 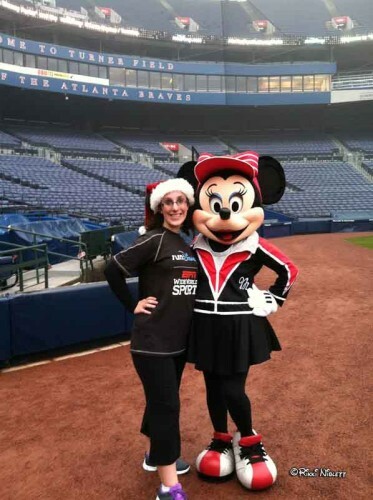 Once we got on the field, we started taking photos in the dugout (I’m a diehard St. Louis Cardinals fan, so I made a joke about the Braves postseason run…though can’t say we’re the champions either…) and then we got to meet up with Miss Minnie Mouse herself. 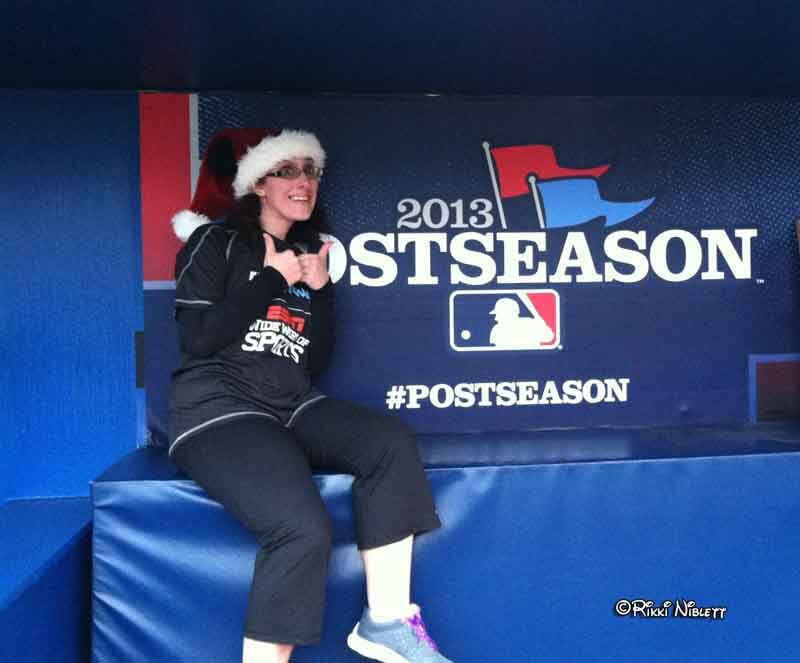 We ran the rest of the way, around the warning track and made our way back to the main entryway for the park. 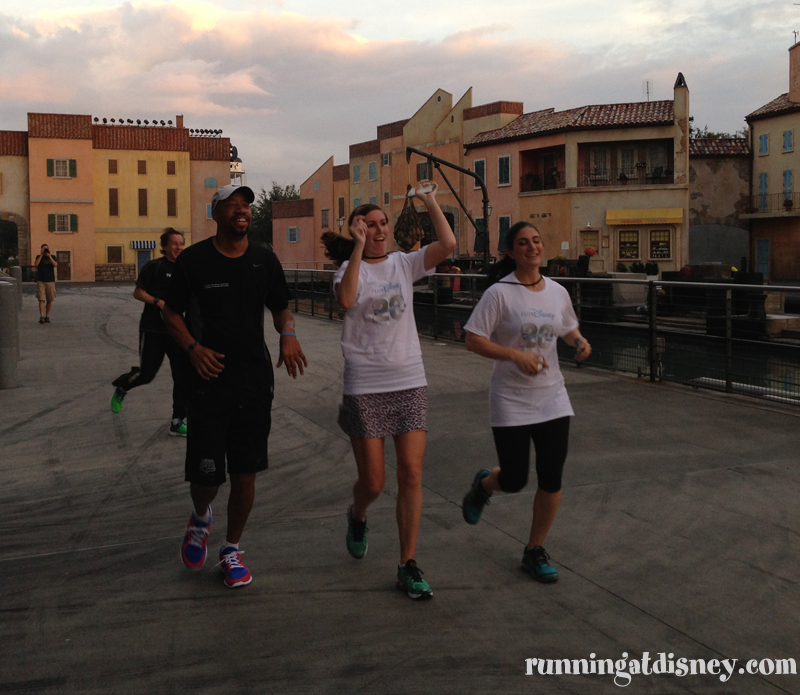 Here, runDisney had a fantastic breakfast for us that featured yogurt, cereal, a spinach and egg quiche, coffee, fruit, and water. 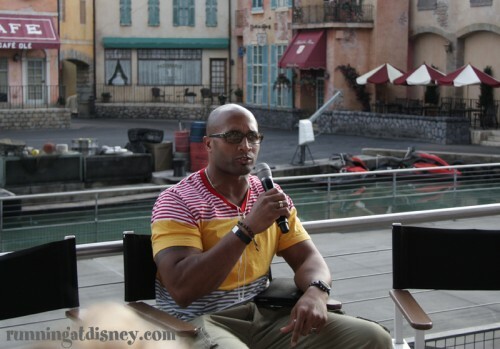 Once settled in, the guest speakers series started. First off, Tammy Jacobson, marketing area manager for runDisney talked about a new hashtag that will be introduced called #WhyIRunDisney. People will be encouraged to submit their own stories of why they run Disney and they may just want to share your story. 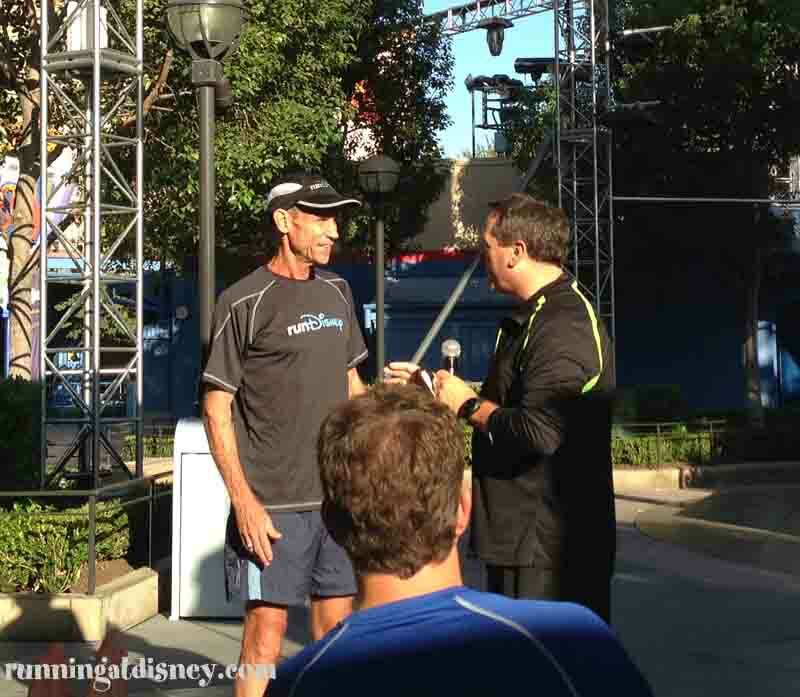 Jeff Galloway then discussed his run/walk method and gave encouragement that truly anyone can run in the big races. 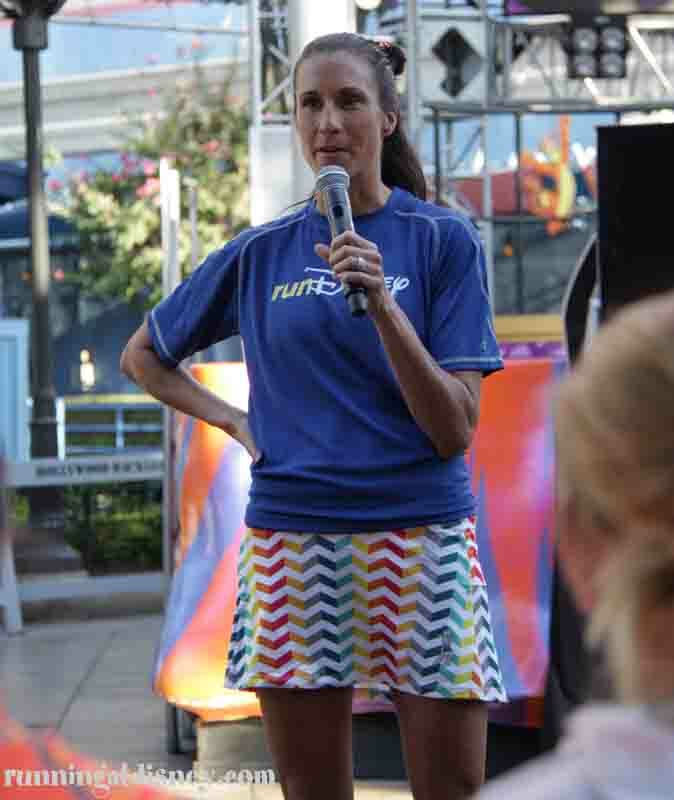 Diet Diva Tara, runDisney’s nutritionist, got on stage to discuss proper nutrition and the importance of fueling up for runners. 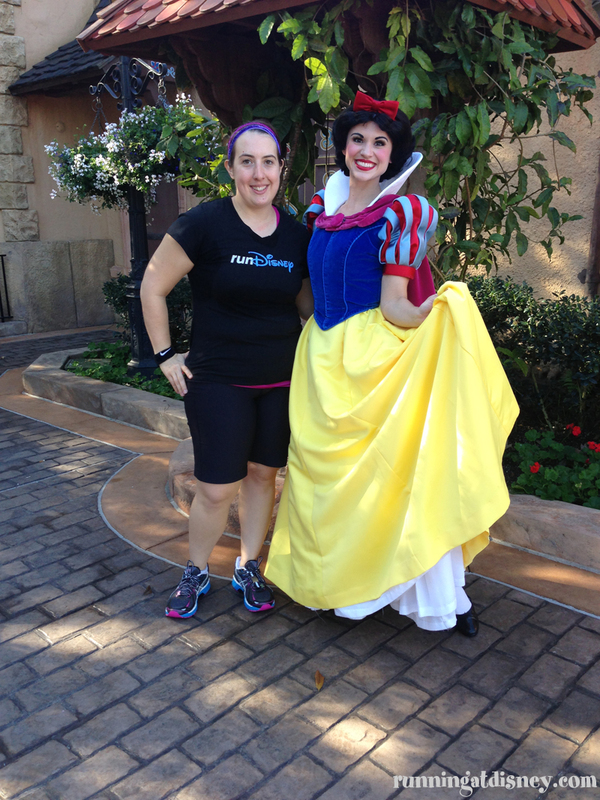 She talked about how gaining wait while training can happen if you over indulge because you know you ran. After that was the part that most of the crowd was excited for…the representatives from New Balance. 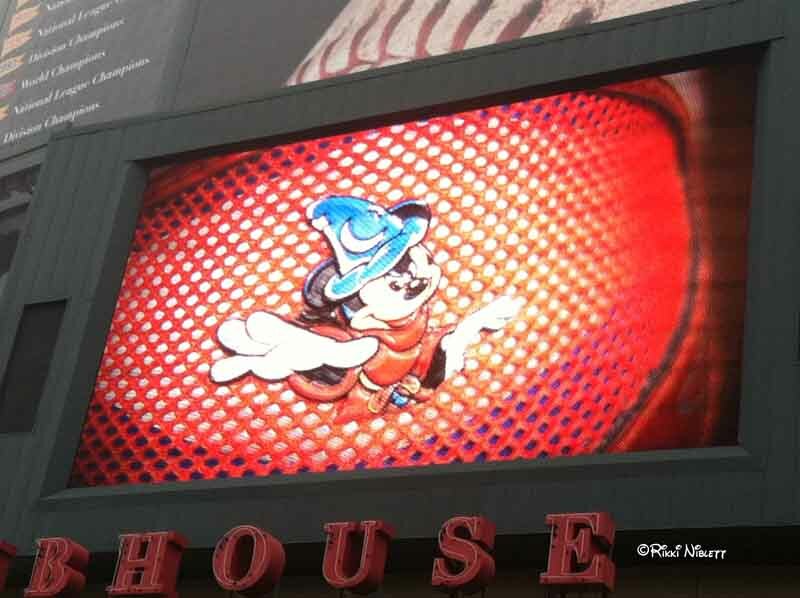 While they didn’t show the actual shoe, they did give us a sneak peek at which Disney character would be featured on the heel. (Sorcerer Mickey will be on the men’s version, and pretty in pink Minnie will be on the women’s option.) The shoes will be the same model, but an updated version of the 360. Also announced was that there would be a kids shoe that would correspond with the adult version. 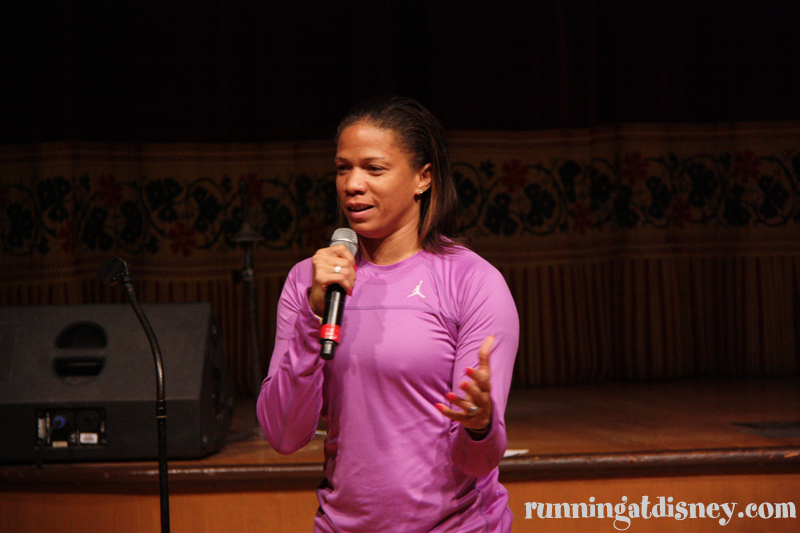 Olympian Barbara Parker then got up and spoke about what it’s like to train for the Olympics and she also announced that she was pregnant during the race that day. 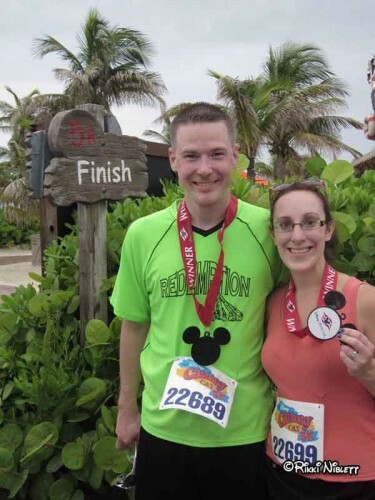 She shared a few tips on how to properly run while expecting. 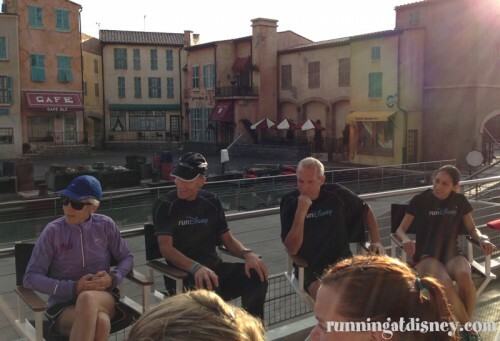 Finally, from Runner’s World, Warren Greene discussed that they are bringing back their challenge to the 2015 runDisney events. 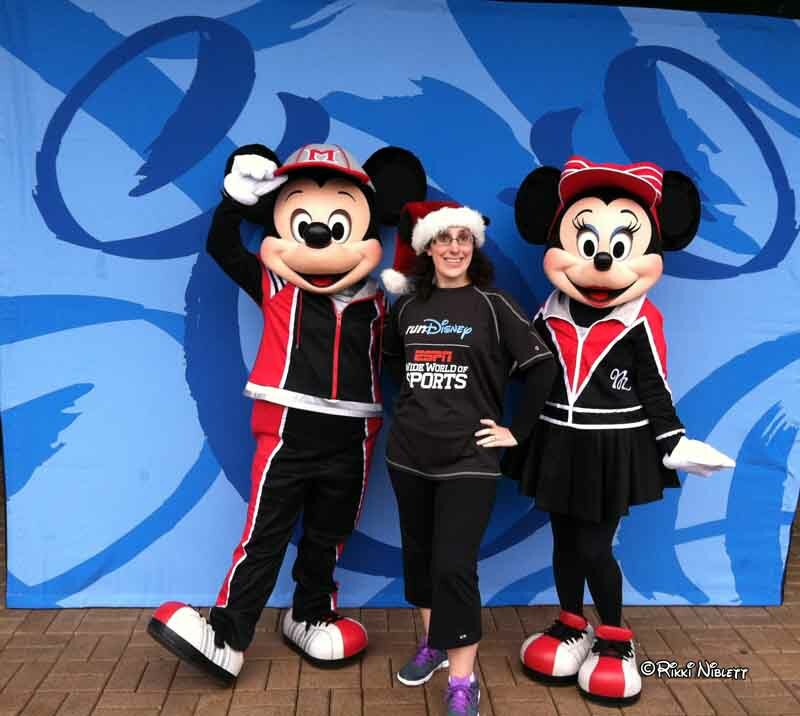 We all then got to take photos with Mickey and Minnie together! Once it was over, we received some awesome swag bags, with a water bottle, Cliff and Luna bars, a gift card for Puma, and more. 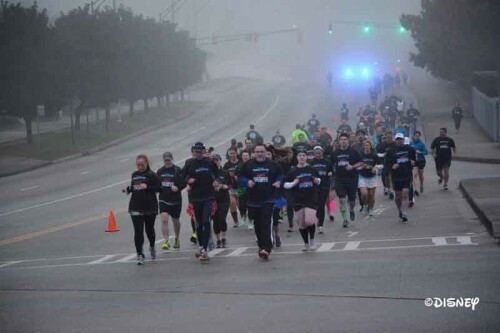 It was a truly awesome event that I am so, so glad I got to participate in. 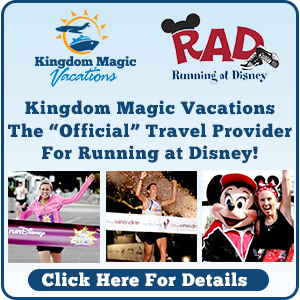 If one of the One The Road To Disney Parks events comes near you, I strongly suggest you try to sign up! They did a phenomenal job. Personally, I believe I am living proof of what runDisney’s mantra is. That anyone can run. 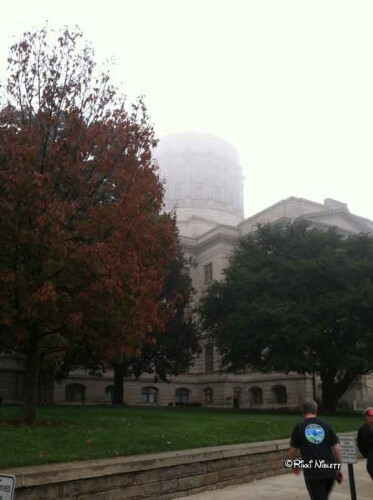 While I still wouldn’t call myself a runner, I have to say, I am excited to get out and go running now. 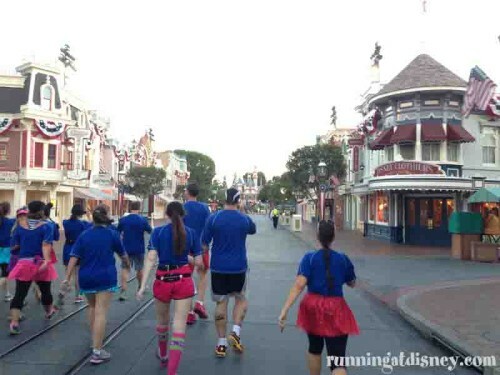 I can’t say that I’ll be doing the next Disney race I can sign up for, but I can say that I’m ready to get more active, a Disney race may be in the cards though. You never know. As for right now, I think I’m going to head for a run. Thanks runDisney! You officially worked your magic on me! 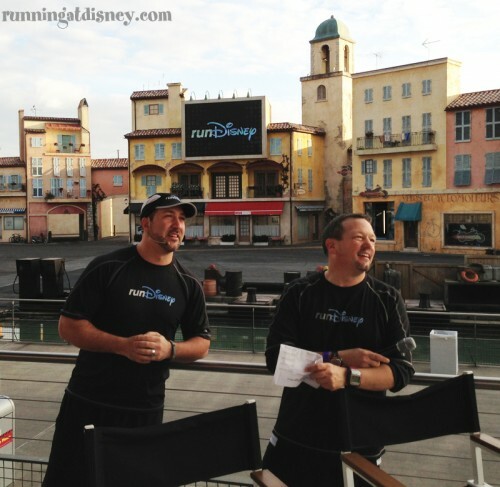 Thanks so much Rikki for this great recap! 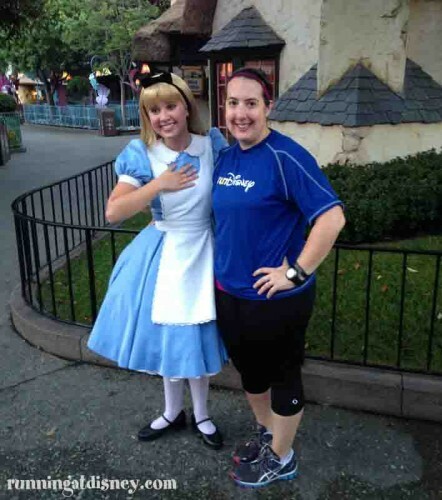 I love to hear when someone else gets inspired to get out there and get fit from a runDisney event…that’s what it’s all about! 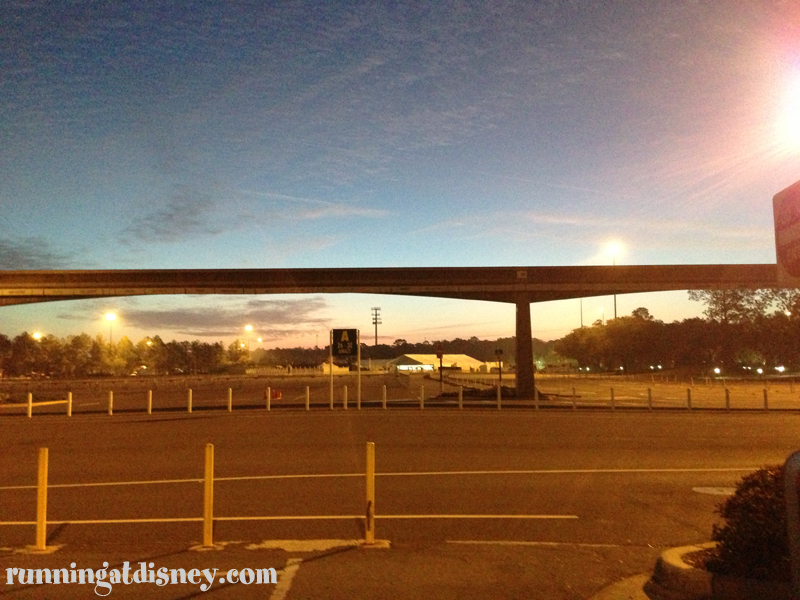 Where do you want to see the next On The Road To Disney Parks event ? runDisney 2013 Wine & Dine Meet Up! Well, it was my third Wine and Dine Half Marathon weekend, and I was extremely excited (and nervous) as the time got closer. 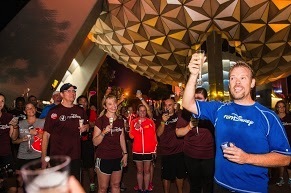 The week before the race though, something great happened…I was one of only 125 people lucky enough to be chosen for the runDisney Wine & Dine Meet Up!!! This was my second meet up (first one was in Disneyland in August), but this was also the first nighttime meet up! The meet up took place the Thursday before the race. 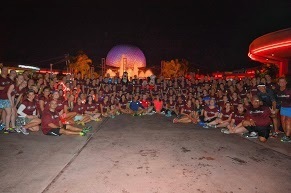 Check in was in front of Epcot at 7:00 pm, where we received a great maroon runDisney shirt, as well as a Fast Pass for Test Track! Something to do until we had to reconvene at 8:45 pm! What was at 8:45 pm you may ask? Exclusive priority viewing for Illuminations!!!! I haven’t seen Illuminations in years, and boy, did I miss it! 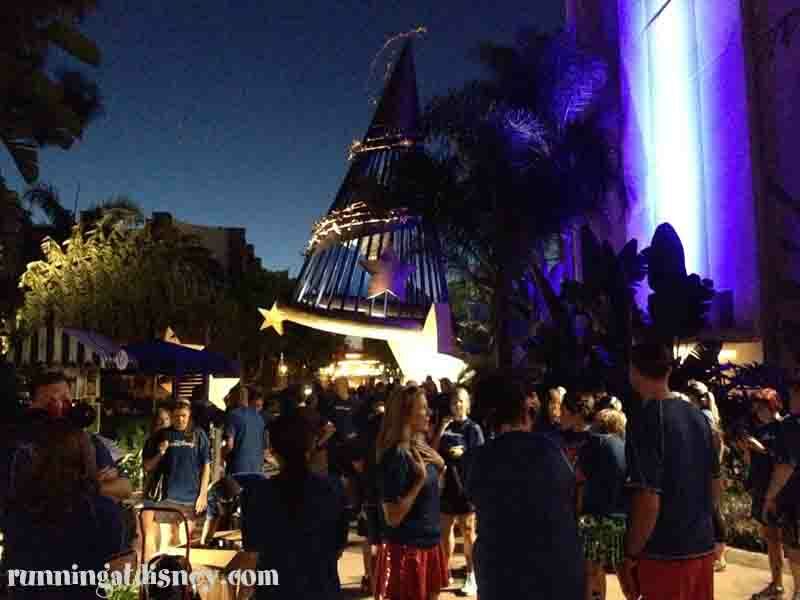 All 125 of us got to mingle for a few minutes before 9:00 pm and the main show took place! 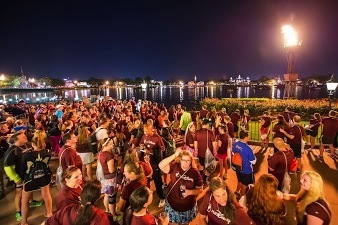 After Illuminations ended and cleared out, we all marched over to the American Garden Pavilion to have some vegan chicken skewers, cookies and vegan wine (who knew there was vegan wine? Not me!!!). After we all got to nosh on some food, we sat down for the main presentation. 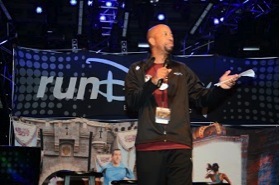 Darrell Fry, Sports Media Director at Walt Disney World, acted as MC to introduce the main guests! 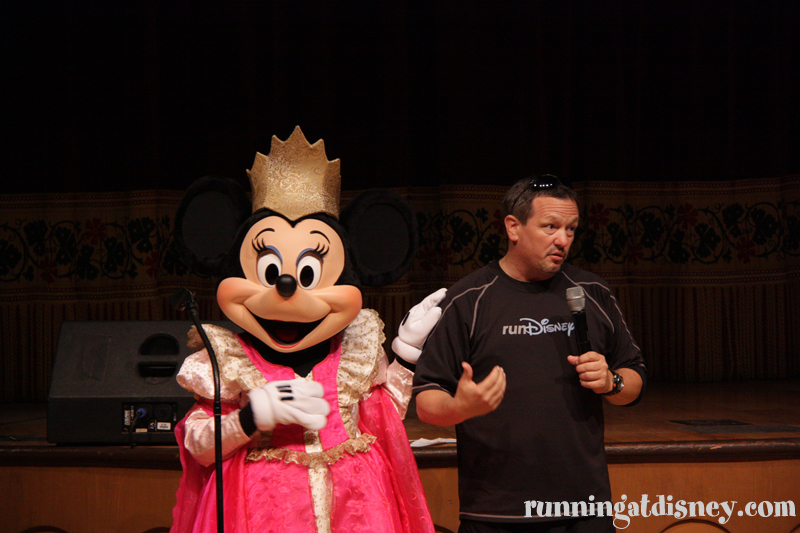 First up was Jeff Galloway and Diet Diva Tara Gidus (Fitness Consultant for runDisney). They offered some great tips for fitness, and how to have the best run possible! After Jeff and Tara, we were treated to a presentation by two of the chefs and a wine connoisseur for Epcot’s Food & Wine Festival! They talked about their favorite foods and wines, and even guided us on what vegan wine actually was! After the New Balance presentation, we got to have pictures taken with the BIG CHEESE!!! (here’s one of me and the head honcho!). Well, the clock was about to strike midnight…and what does one do during the Wine & Dine half weekend at midnight? Have a champagne toast! Overall, it was a great meet up, got to meet some great people and see old friends, and spark the flame for the weekend! 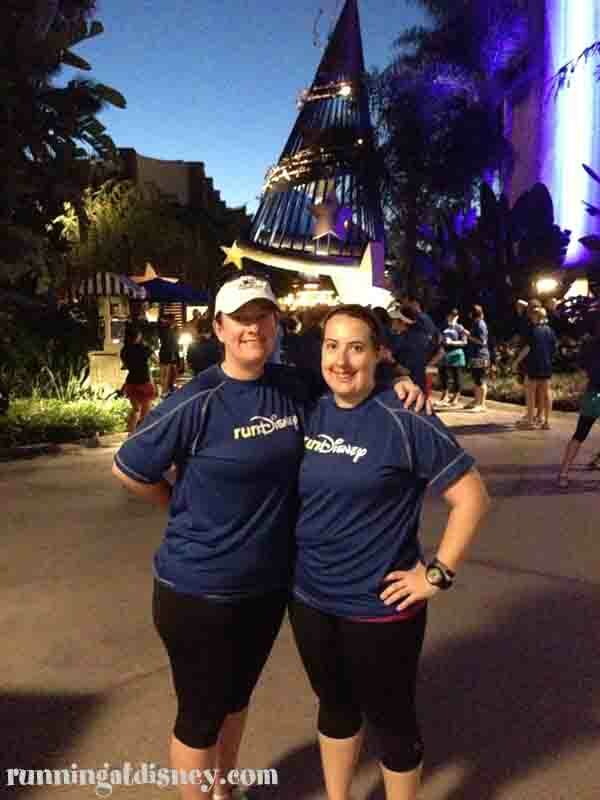 runDisney meet ups are amazing! If you ever have the lucky opportunity to attend one, get pumped for some fun and surprises!!! Cheers! 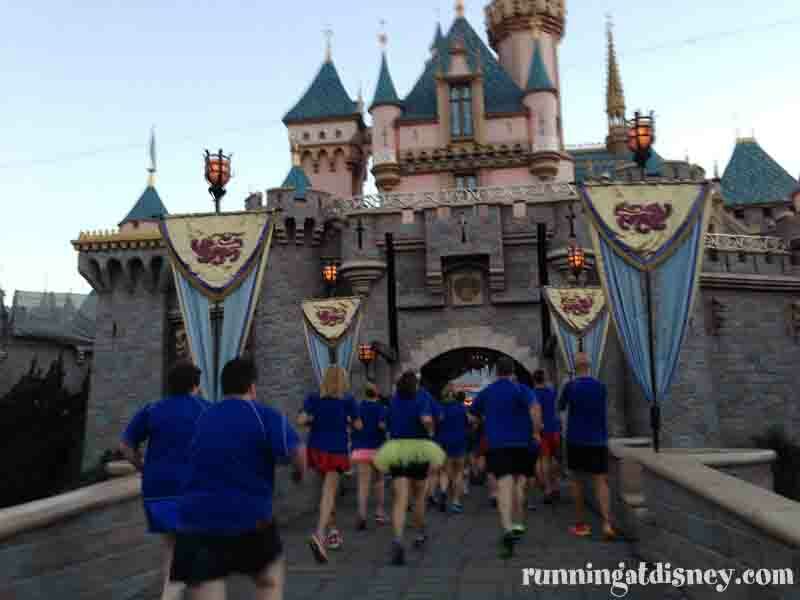 A Mad runDisney Meet Up Through Disneyland! To say that my first trip out to Disneyland was magical is an understatement, but who knew it would be mad?! Well runDisney did of course! 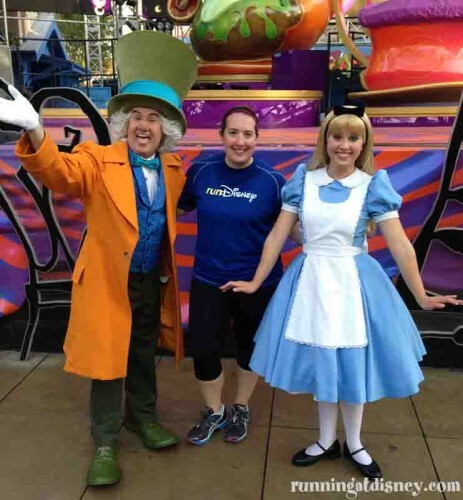 With the new Disneyland 10K theme focused around Alice in Wonderland, it was only fitting that the runDisney meet up theme would be centered around the film as well. 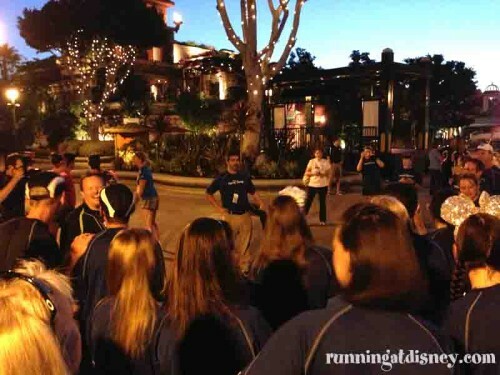 As with most runDisney meet ups, the 2013 Disneyland Half Marathon Weekend meet up started at the crack of dawn. 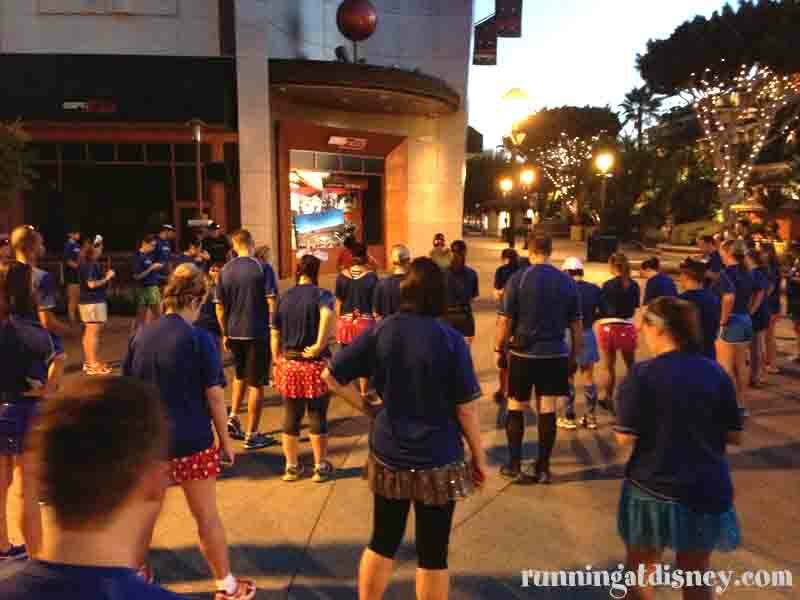 Over 50 runners met under the Sorcerer’s Hat at the Disneyland Hotel bright and early to run our way through the parks, we must be mad to do that! 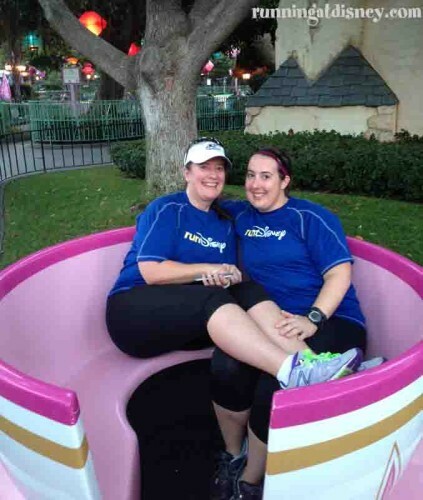 runDisney BFF Amanda & I! We made our way over to Downtown Disney to get the low down on the run from Tony Morreale of Disney Sports and get some great tips on good form running from the folks at New Balance. They came up with a great mnemonic to remember this by: Party’s Make Cinderella Late…genius! 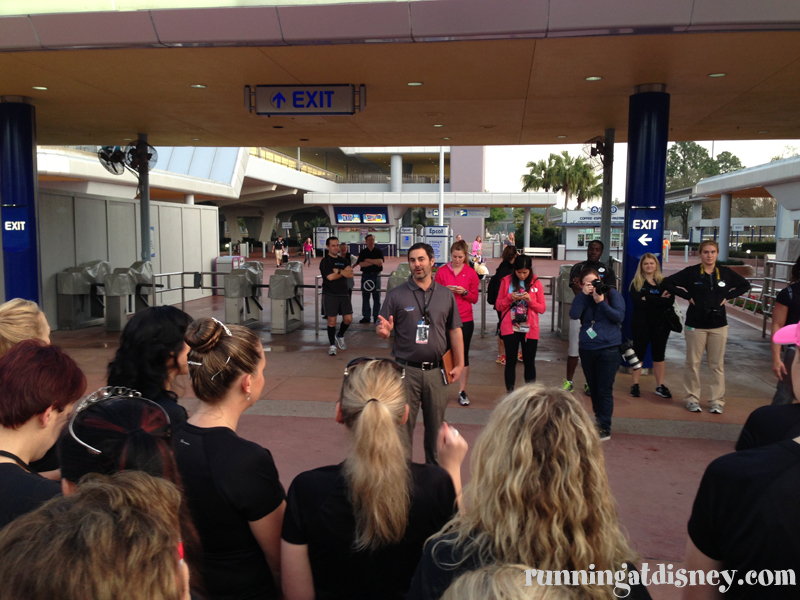 We walked through each goal and were encouraged to try to use these tips as we ran through the parks. Easy for them to say…I knew I would be distracted by all the Disney goodness on our run 🙂 Luckily there is a video available to brush up on good form running while at home. Then guess who interrupted our lesson?? 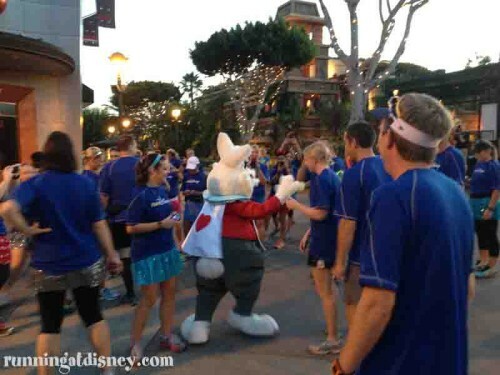 The White Rabbit of course! And as usual, he was LATE! 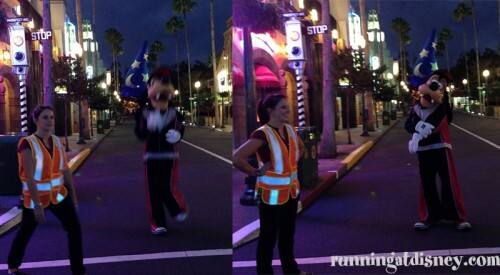 But what else were us Disney runners to do, but chase him?? Off we ran through Downtown Disney and into Disneyland Park. 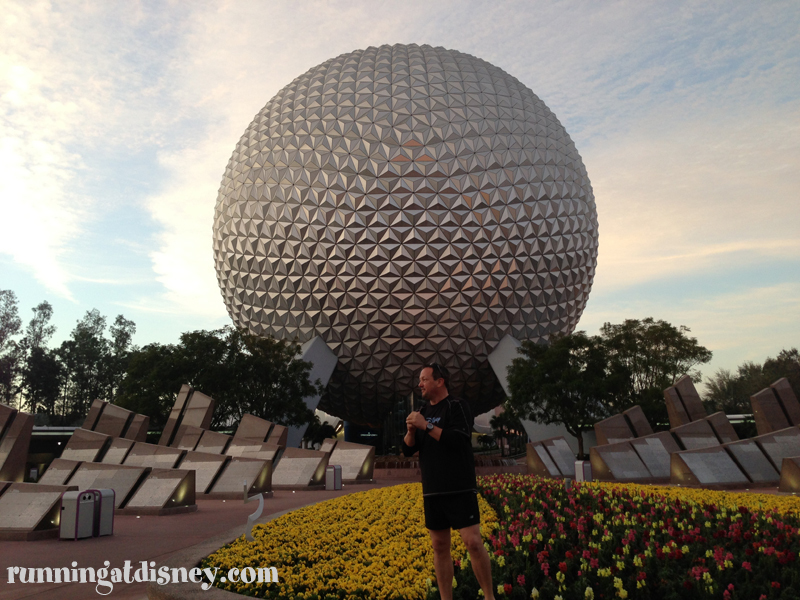 Even though I had visited the park for the 2 days prior, there was something magical about being there at dawn. And then running down Main Street USA with Joey Fatone (totally surreal for this ‘Nsync fan) and through Sleeping Beauty Castle made it even more magical. As we entered Fantasyland, I noticed the group in front of me slowing down and wondered what was happening. Then I saw Alice and was so excited for a fun photo op! 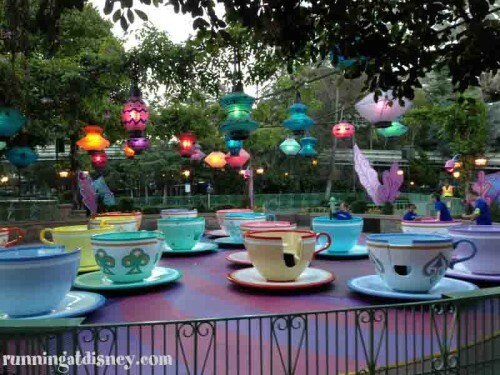 What I wasn’t expected was that we were going to be able to ride the Mad Tea Party!! 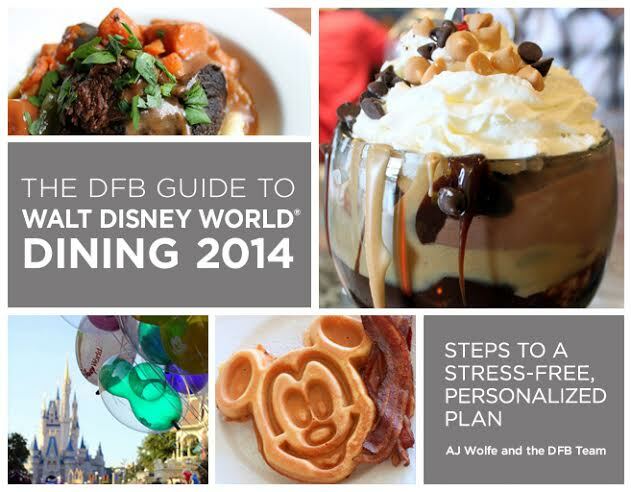 As a Walt Disney World native, I must say I LOVE this version of the attraction. It is out in open and the lanterns are so whimsical. I often find it difficult to get someone to ride the tea cups with me in WDW because of all the spinning, so I was excited to get to experience this in Disneyland with no wait! 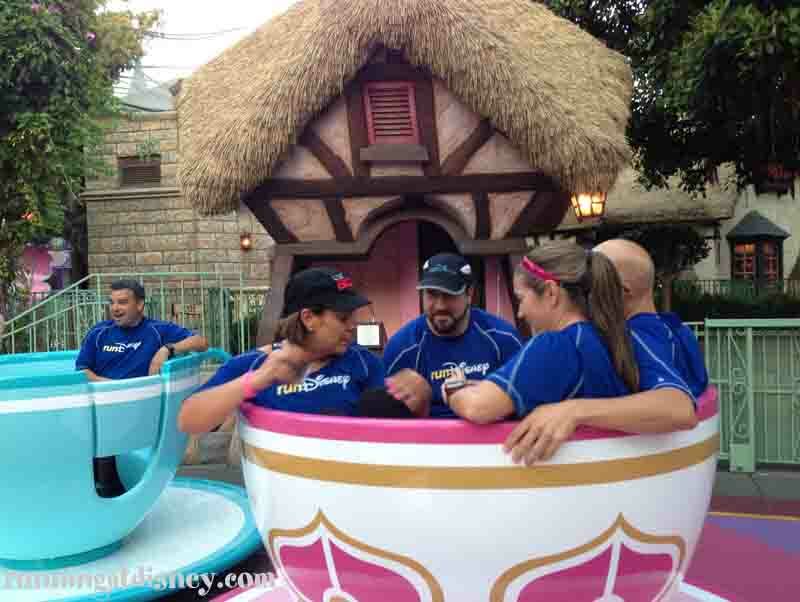 How many celebrities can you cram into a tea cup? I totally could’ve stayed on there all day, but we had to move on. 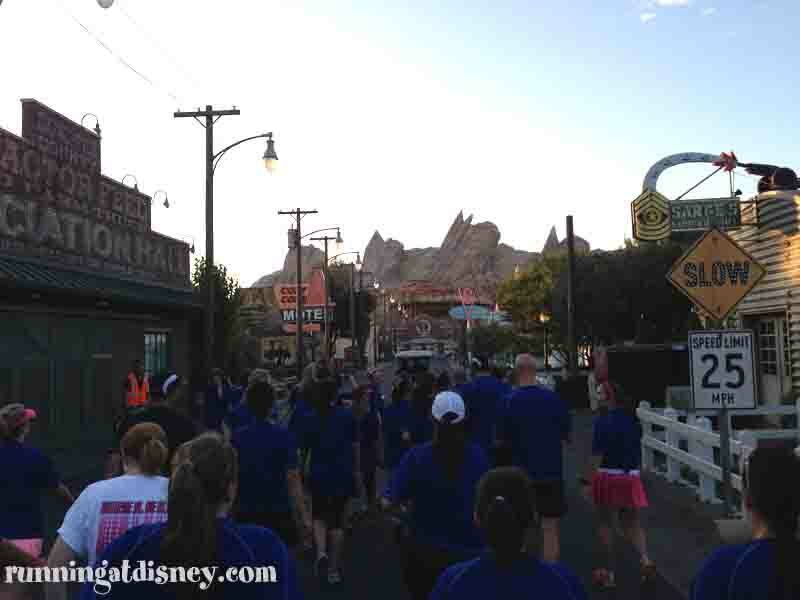 We ran through Tomorrowland and back down Main Street towards Disney California Adventure. Do I look excited?? 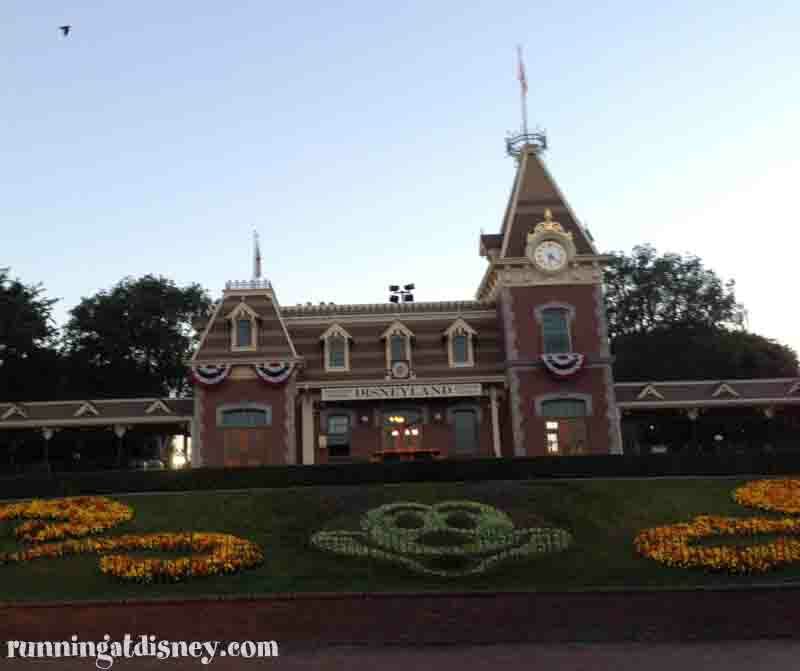 We headed towards Cars Land, which was equally as beautiful in the early morning hours, and then on to Hollywood Land and what else but the Mad T Party area! We were welcomed by Bob Hitchcock of Disney Sports and treated to a continental breakfast and some much needed coffee. Then the highlight of the morning…something I totally was not expecting. 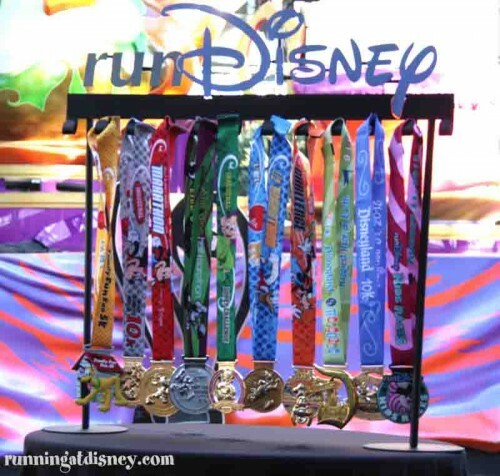 Bob and Faron Kelly of runDisney Marketing unveiled the new runDisney medals for the Wine & Dine Half Marathon and Walt Disney World Marathon Weekends! O.M.G. they are gorgeous! I can’t wait to get that new Wine & Dine medal in 2 short months!!! To say the group was excited is an understatement. 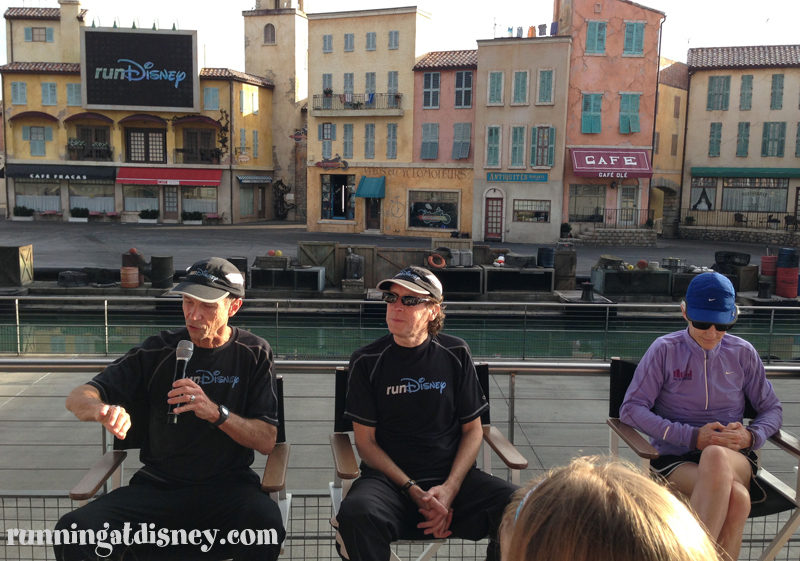 Bob and Faron fielded questions about upcoming events and any new races that runDisney has planned, but didn’t give up too much. 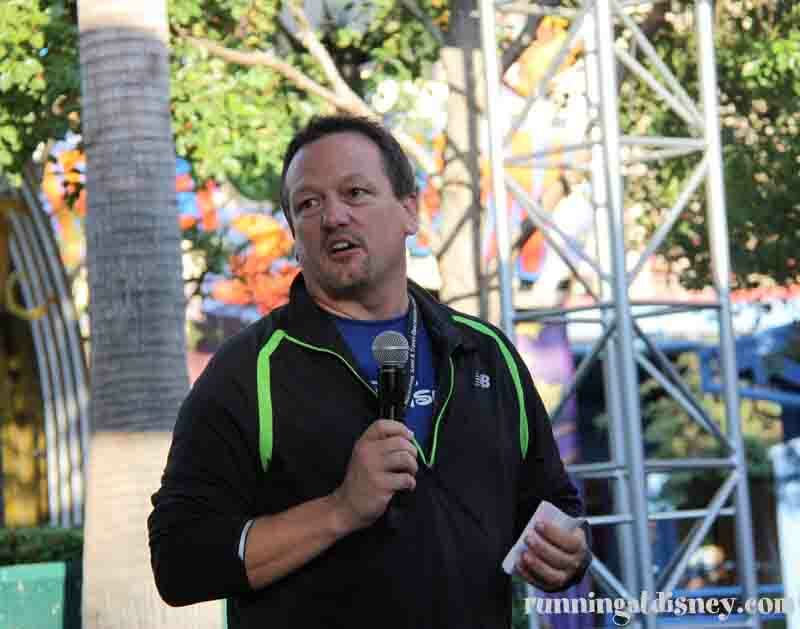 Faron just eluded that runDisney is “efforting” new races…does this mean a Disneyland Paris race is in our future?? We can only hope! 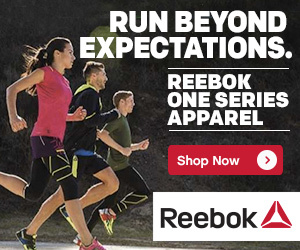 Interval runs, tempo runs and long runs are the essentials for race training. Don’t forget to take in the scenery! Roctane is great for fuel while running. She takes one every 30 minutes. My favorite running coach, Jeff Galloway, shared his story of how he began running. Who knew that super skinny Olympian was once a fat, lazy teenager?? I never would’ve guessed it! Well he was until he joined his cross country team at the age of 13 that he began running. 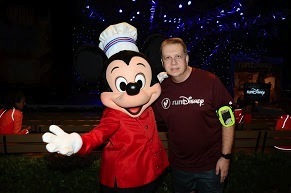 He did it because he wanted to be part of a team, which is how he feels about runDisney events. 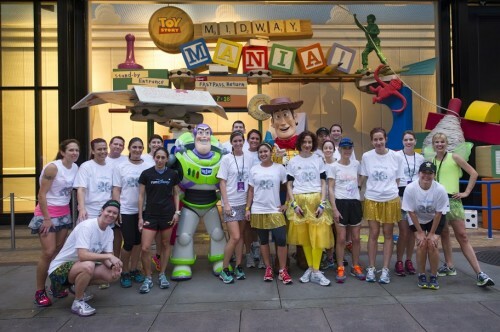 We are all part of one big team, encouraging each other along the way. That couldn’t be more true. 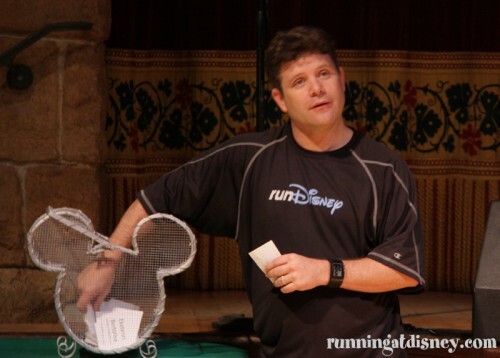 Ali Vincent, the first female winner of The Biggest Loser, and Sean Astin (Goonies, Rudy, Lord of the Rings) continued with the motivational theme and their struggles with staying on track. Ali finds motivation in races. Once she is signed up for a race, it gives her that push to keep training even though she hates getting up in the morning. 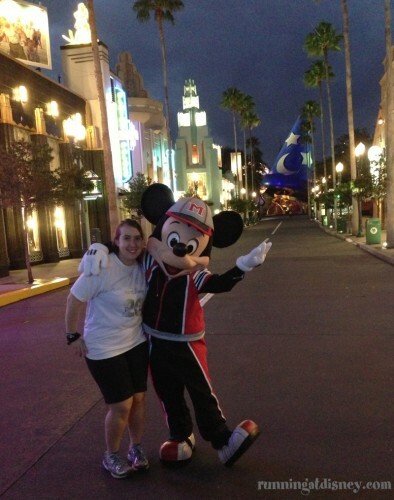 She has even signed up for the Dopey Challenge in January! 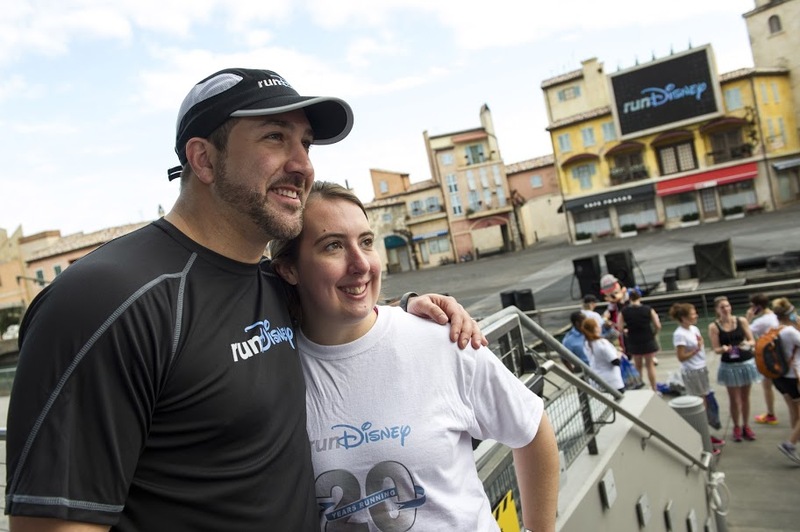 Sean shared a wonderful story about running with his daughter and how the Galloway run/walk method helped to get her out there. They have found what motivates them and stressed the importance of finding ours! 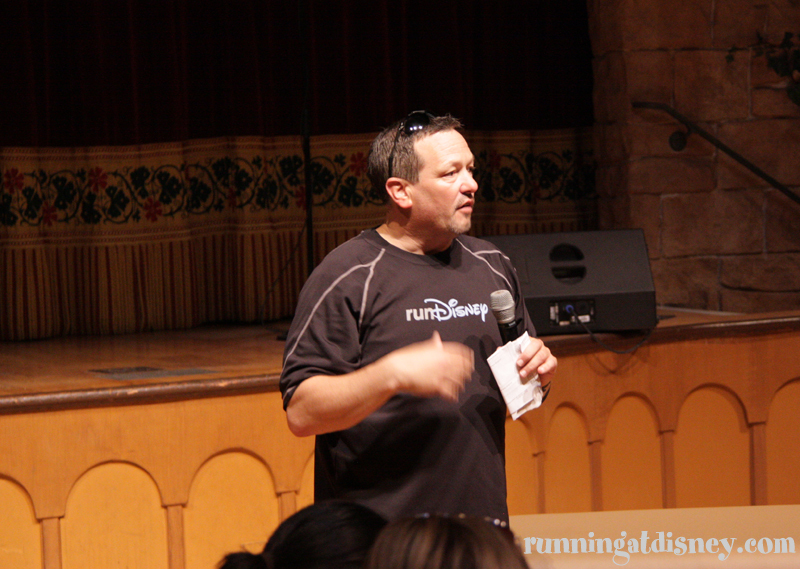 No runDisney meet up would be complete without some great giveaways. A few lucky attendees won the official runDisney New Balance sneakers, runDisney laptop cases, runDisney travel bags and even a race entry for the 2014 season! Giveaway ALL the runDisney swag! Have you ever attended a runDisney Meet Up? What speakers would you like to see there? Disclosure: I was invited to attend this as media. 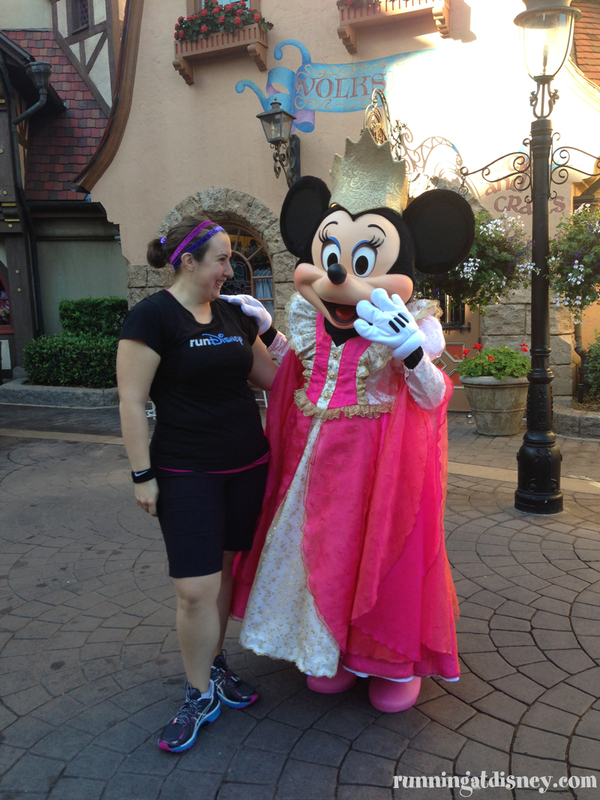 As always, all opinions are 100% my own and I am 100% obsessed with runDisney events. 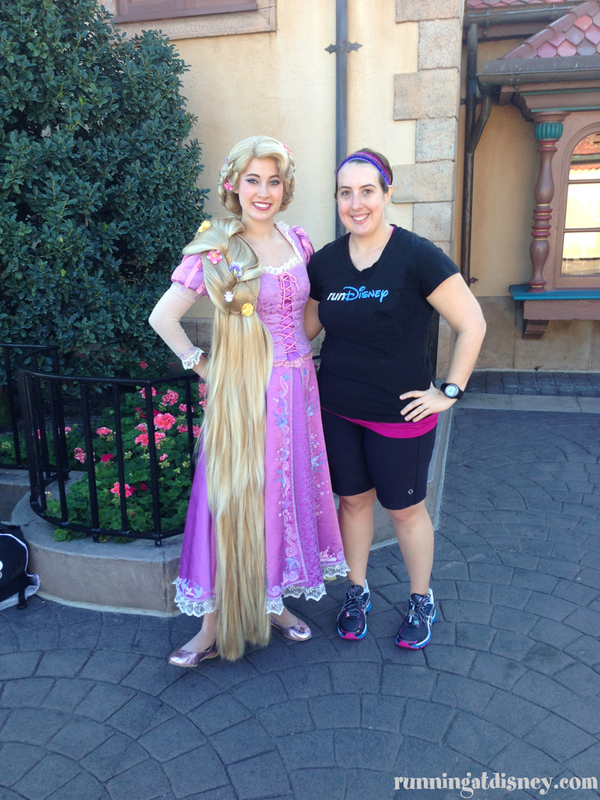 A Royal runDisney Meet Up! 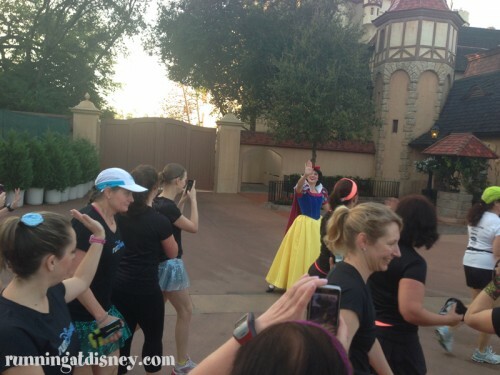 Disney’s Princess Half Marathon Weekend is full of tutus, tiaras and sparkle unlike any other race out there. 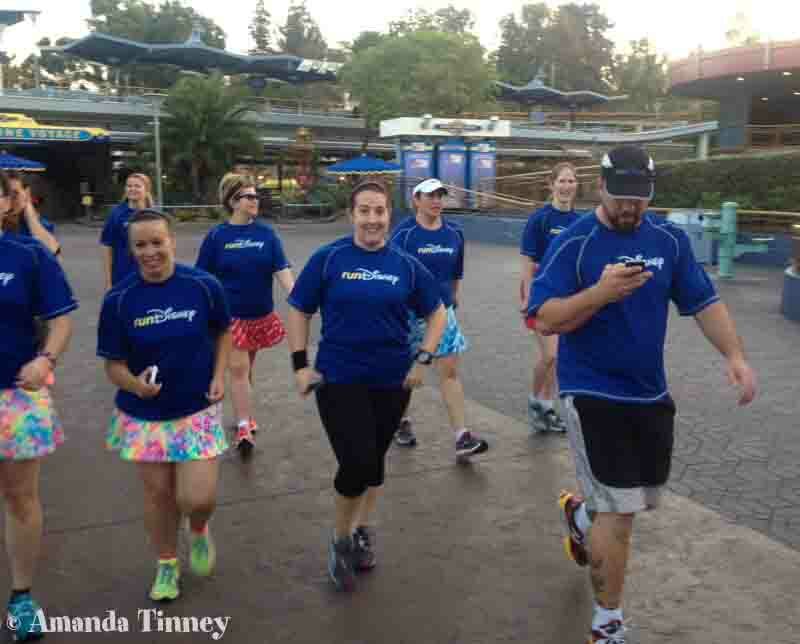 With all of these runDisney fanatics in one place (myself included), it’s no surprise that the coveted runDisney meet up/ tweet up was a seriously hot ticket. 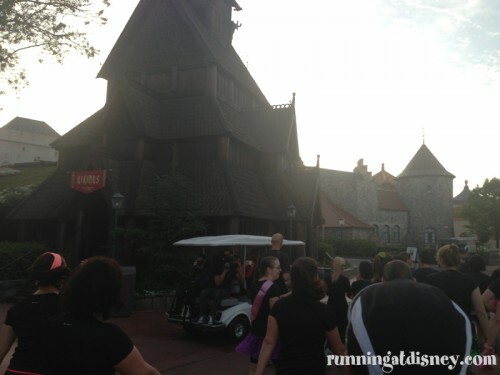 So hot in fact, the Disney Parks Blog was brought to a screeching halt a week before the event! I mean it’s understandable, right? Where else can you run through an empty Disney park being led by some seriously elite runners?! The meet up began at 6:30 am with check-in at the entrance to Epcot. 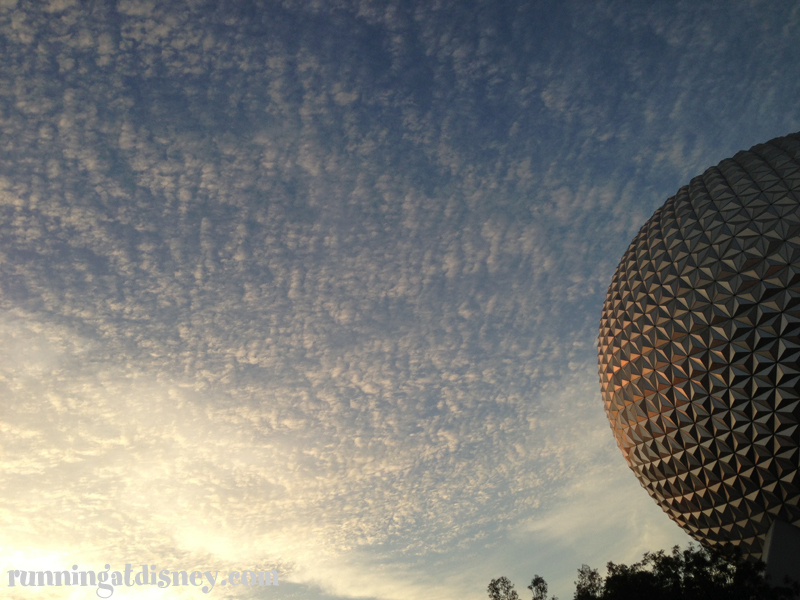 I love this time of day at Walt Disney World. Everything is quiet, peaceful and just coming to life…a stark difference from the throngs of people that would be arriving in a few short hours. 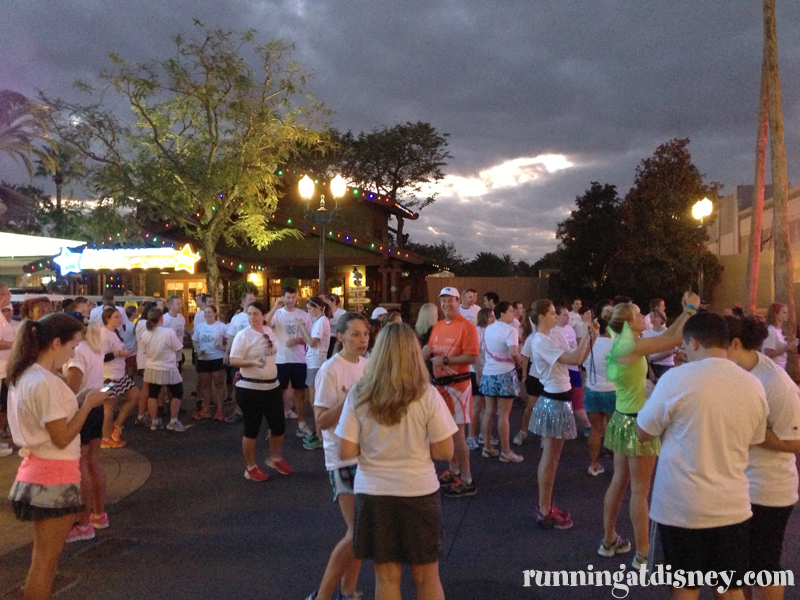 5K & Half Marathon Finish Lines! 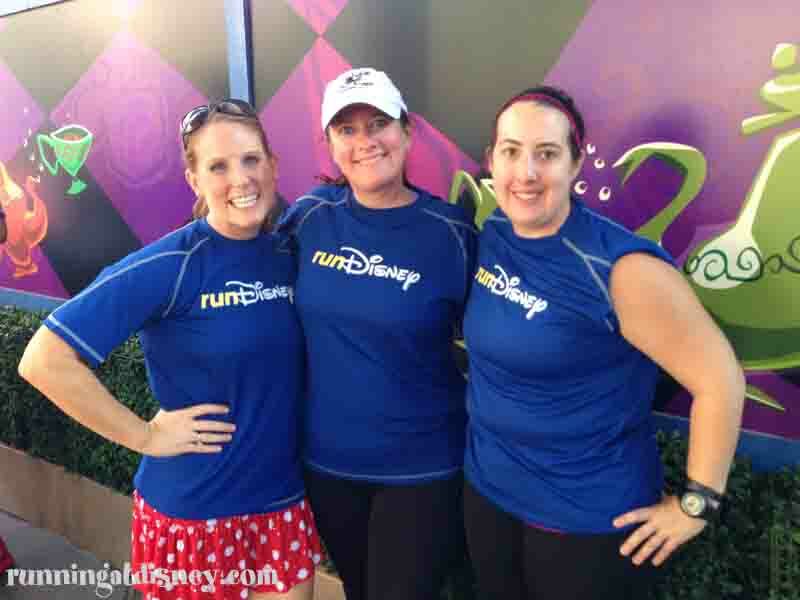 We all checked in, signed our lives away to Disney waivers and were given a runDisney t-shirt. 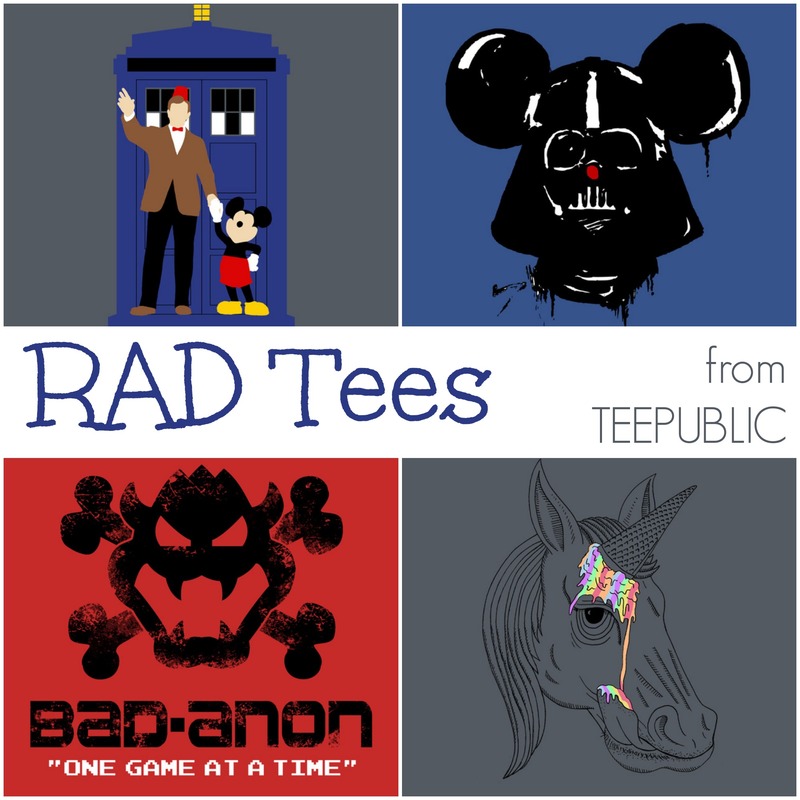 I LOVE these shirts…the women’s cut is great! What a gorgeous morning, despite the insane humidity. There is something different about Florida skies that we just don’t have up here in Connecticut. The clouds are breathtaking…what a treat! Before the morning started, we had some time to chat with the runDisney folks, celebrities and fellow runners. 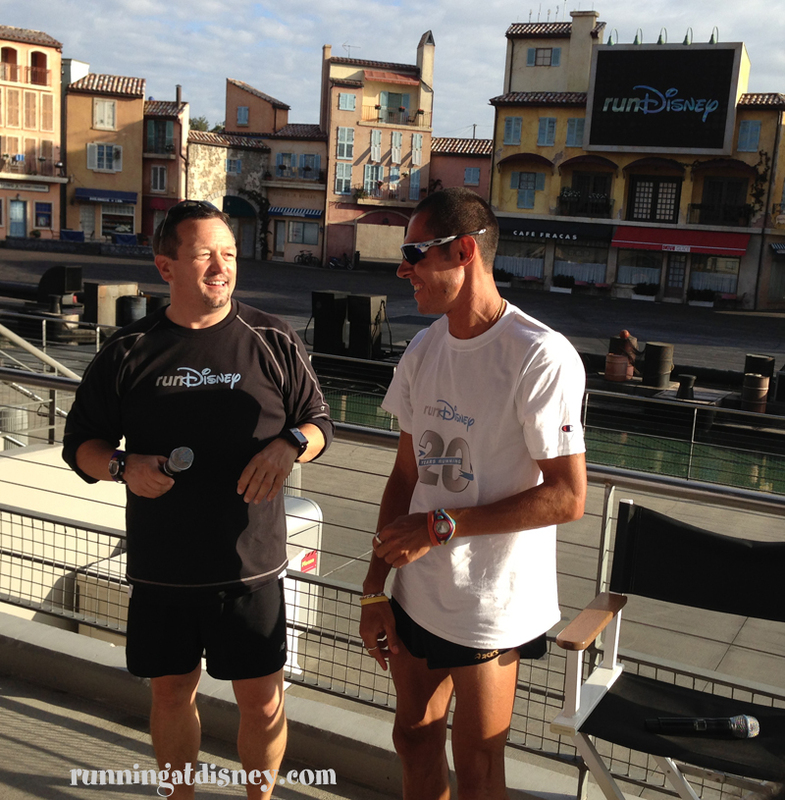 It was great to see a lot of new faces at the meet up and also reunite with some old friends from past races. 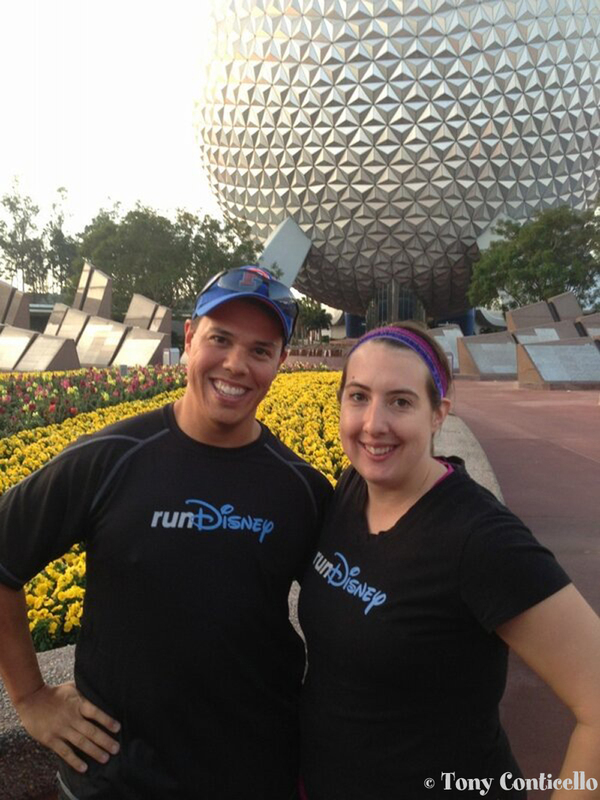 Before I knew it, it was 7:00 am and we were ready to start our run! 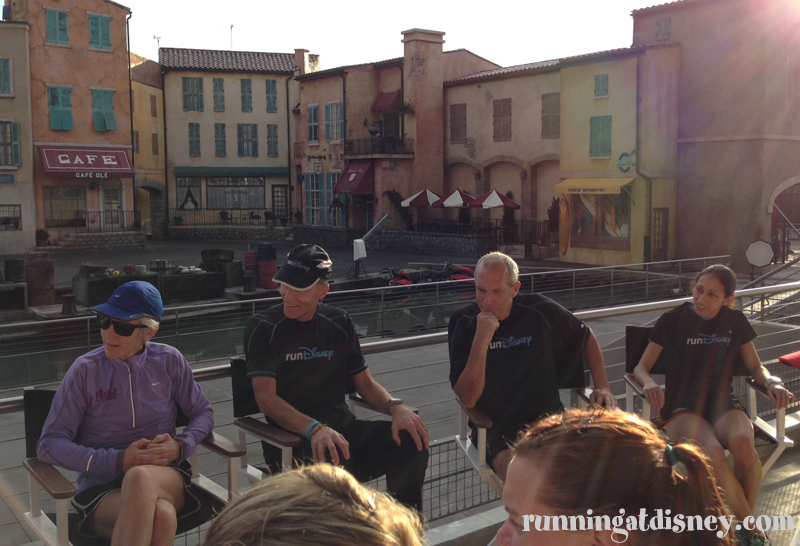 We were briefed by the runDisney team on the course, a 3-mile run around World Showcase and Crescent Lake finishing in the Germany pavilion. There were two groups that went out. The first was a faster group keeping a 9 minute mile pace and led by reigning Princess Half Marathon champion Rachel Booth. I’m nowhere near fast enough to keep up with that crew, so I decided to stick with the group led by Jeff Galloway. 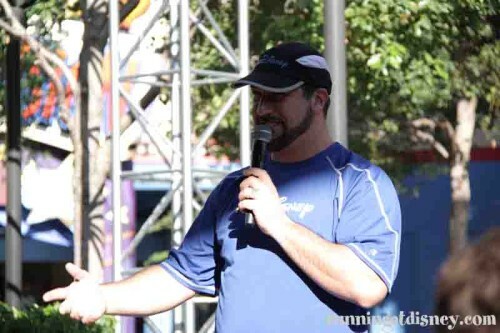 I’m a huge fan of Jeff’s, so any chance I get to run with him I will. Plus, the 30 sec run/ 30 sec walk intervals are more my speed. 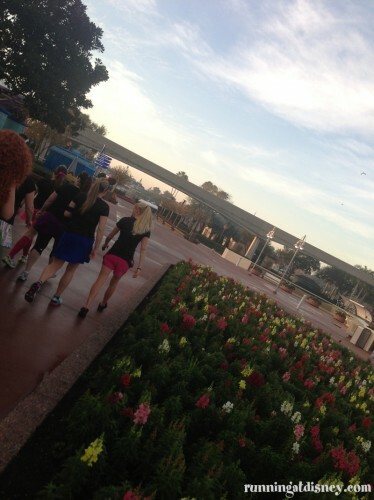 We went through Future World and clockwise around World Showcase Lagoon…and look we saw some Princesses along the way! 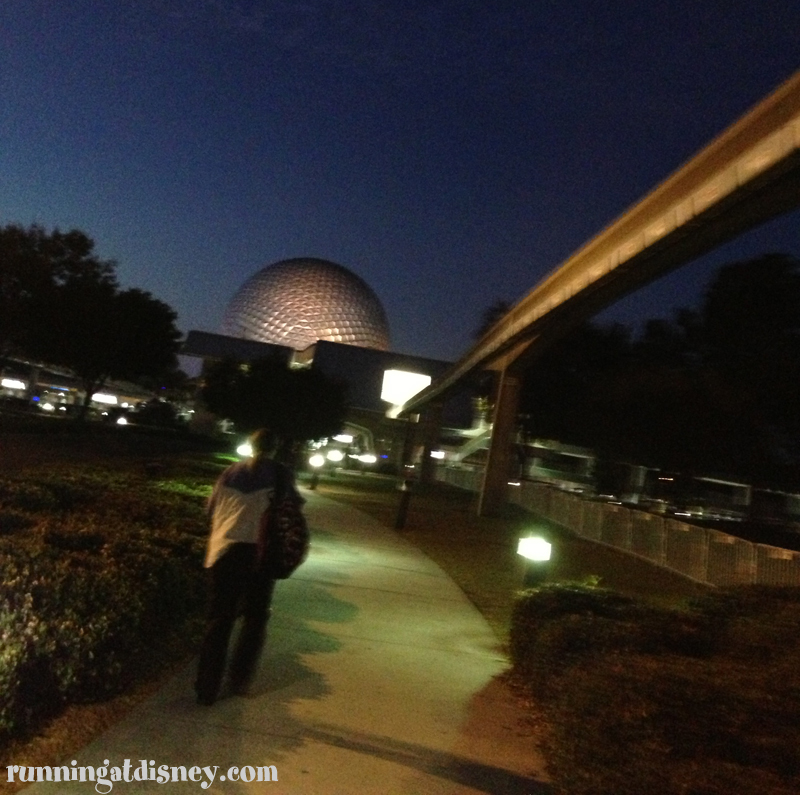 When we reached the International Gateway, we headed out towards the Boardwalk Resort and around Crescent Lake. 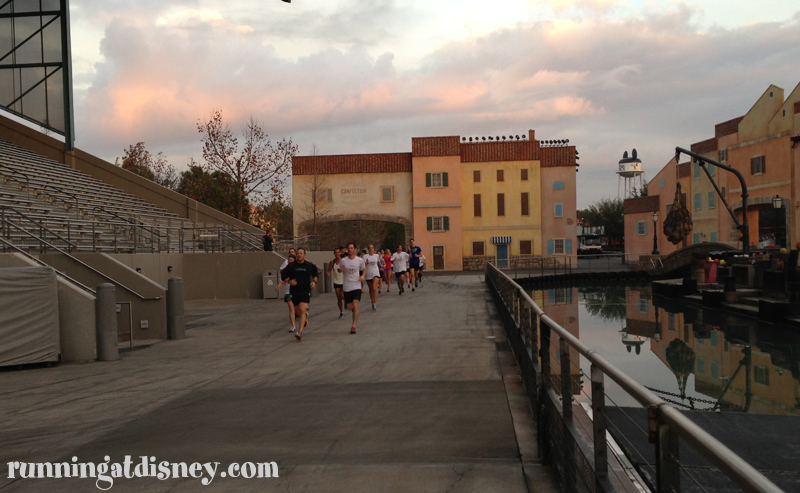 This is a gorgeous area for a morning run, but running around there was bringing back some painful memories of the Walt Disney World Marathon a few weeks prior! We entered back into Epcot and circled back towards Germany where a nice breakfast (they still need some healthier options!) and some much needed cold water were waiting for us. We were welcomed by Bob Hitchcock and Faron Kelly of runDisney who told us a bit about the history of Disney’s Princess Half Marathon and gave us ladies some serious props for making running so popular. Did you know that this race has grown from 7,000 runners in 2009 to 27,000 in 2013?!? Go ladies! 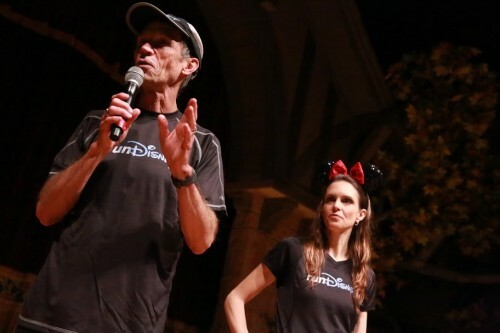 Jeff Galloway and Tara Gidus, official nutritionist for runDisney, took the stage next to give us some helpful tips for the race. A heat advisory had been issued for the weekend and they helped prepare us for dealing with that, including proper nutrition, hydration and pace. 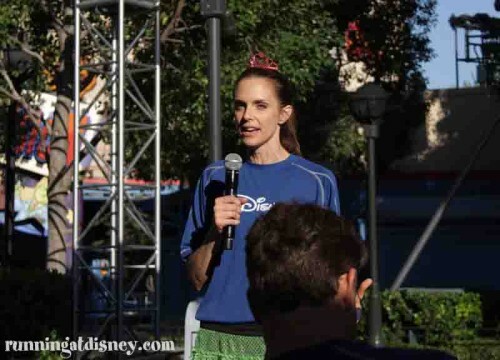 Rachel Booth, two time Disneyland Half Marathon winner and reigning Princess Half Marathon winner, also made a brief appearance. What an amazing athlete!! Next up were the truly inspirational moments of the morning. 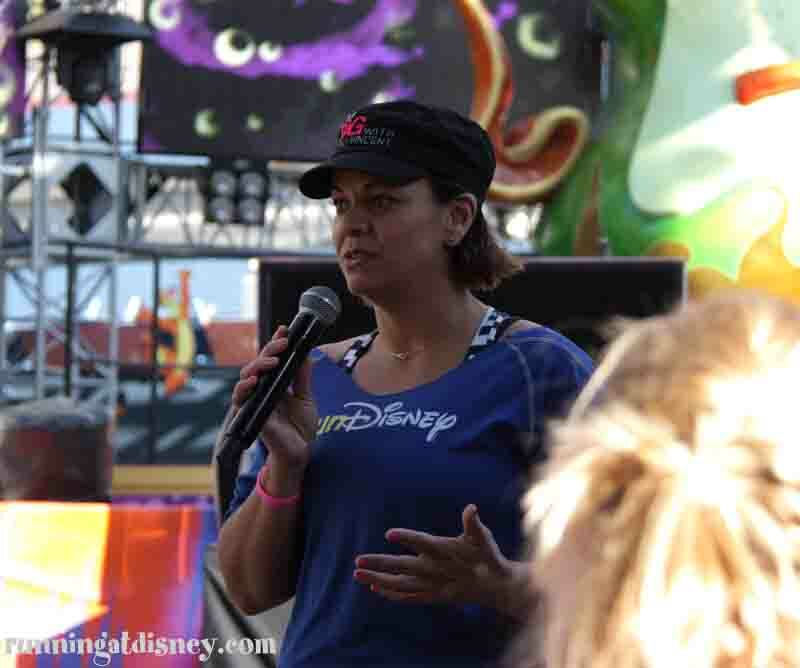 Ali Vincent, the first female winner of The Biggest Loser, spoke about her weight loss journey and how adopting a healthy lifestyles completely changed her life. She had a few gym towels to give away and had a very unique way of choosing who received them. She asked everyone who had ever lost weight to raise their hands and then asked people to put down their hands based on how much weight they had lost, getting up to 100 pounds. It was quite amazing to see how many people had lost significant amounts of weight and be able to congratulate them for their accomplishment. 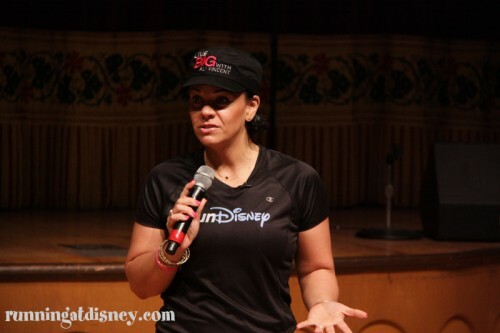 Most inspiring of all was April Holmes. Wow…just wow. After a train accident 12 years ago resulted in April losing her left leg below the knee, she set out to be the fastest Paralympic athlete in the world and accomplished that many times over. April has won numerous gold medals in the Paralympic Games in both 2008 and 2012 and continues to break World Records every year. Her story of loss and overcoming the odds almost brought me to tears and motivated me to try and be better in everything I do. She left us with this: “Your gold medal comes from being better than you were yesterday.” From now on when I’m having a tough day, I will think of April and her strength. Simply amazing. 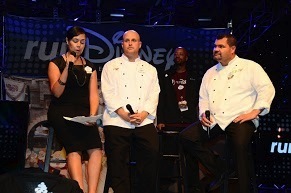 The final presentation was from the folks over at Senses Spa, which recently opened at the Grand Floridian Resort. They talked about various recovery techniques including foam rolling and massage. Two lucky attendees were chosen for the demos! 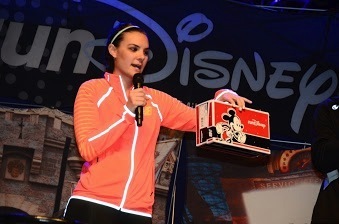 Now it wouldn’t be a runDisney event without some giveaways. 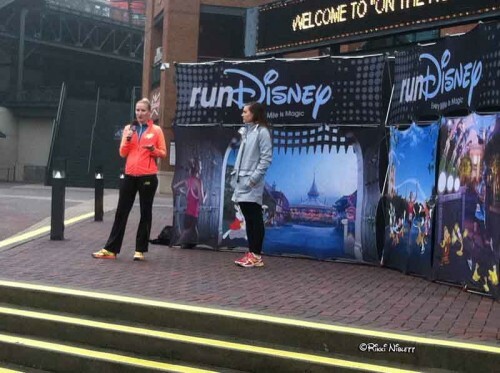 The folks at New Balance were on hand to talk about the success of the new runDisney shoes that debuted over Marathon Weekend and they gave away a few pairs! Look who chose the winners…Sean Astin! 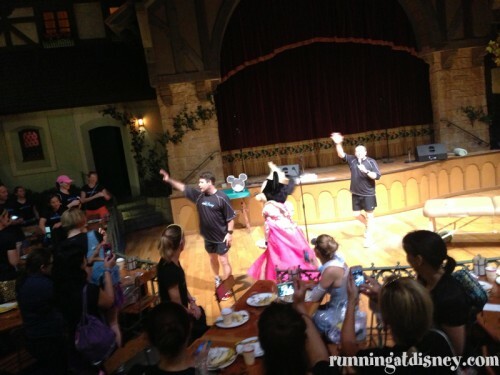 The meet up wrapped up with an appearance by none other than Princess Minnie! I mean obviously she would be there. We also found out that is was Sean Astin’s birthday, so everyone joined in to sing to him! 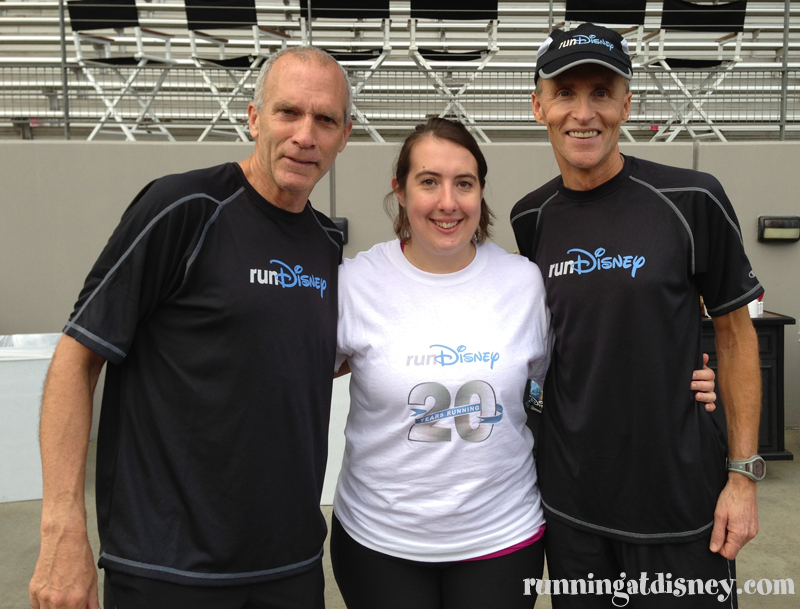 The 20th Anniversary Walt Disney World Marathon Weekend certainly lived up to all expectations. The entire resort seemed to be overtaken by runners…I have never seen so many in one place!! 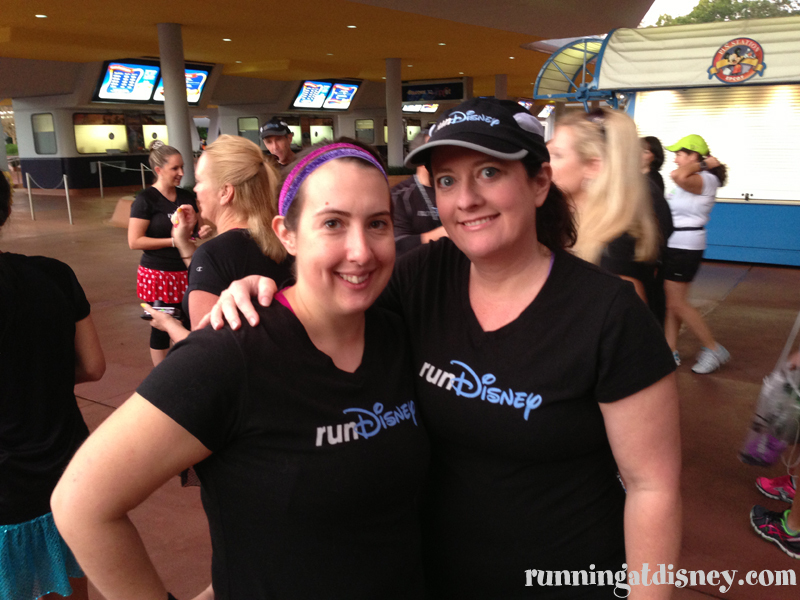 To kick off the weekend, runDisney hosted one of their infamous meetups that I was lucky enough to be invited to. 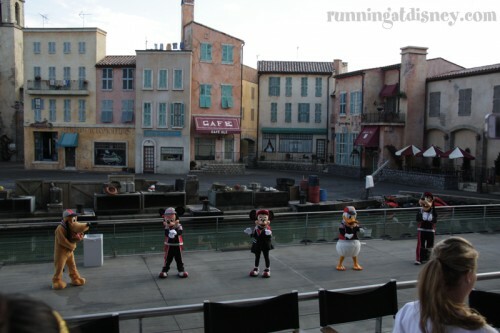 Mickey, Donald & Goofy were all there in their awesome track suits and as good Disney fans do, we all lined up to get our pictures taken. I absolutely LOVE the Studios and it was great to get this photo op on an empty Hollywood Boulevard. Me & the Big Cheese! We were greeted by Tony, Bob & Darrell from Disney Sports and given instructions on how the 2.5 mile run portion of the meetup was going to go. 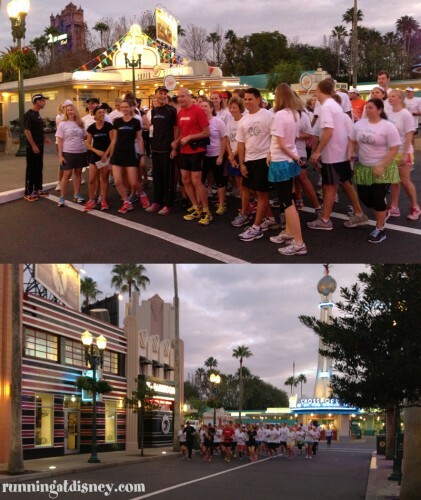 There were 2 groups, one for strict runners and one for run/walk. The runners were going to keep a 9-10 minute mile pace and Bob was leading the pack. However, I heard it was more of an 8 minute mile! 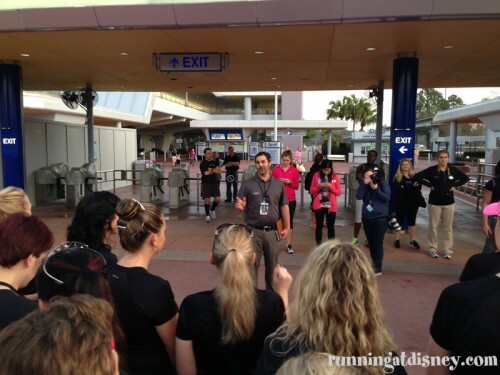 The run/walkers were led by Jeff Galloway and they were doing 30 second intervals. I had unfortunately been battling a nasty cold in the days leading up to the meet. In fact, I had a fever of 100.2 just the day before! In order to save myself for the marathon a few days later, I opted to not run that morning. 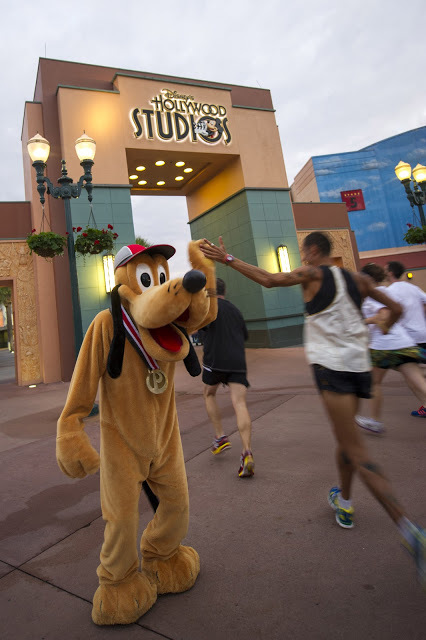 I was bummed to not get the experience of running through the Studios and meeting the characters, but my health had to come first. Good news is I got some fun pics of the Galloway group starting off! Look at some of the characters they encountered along the way! The second half of the meet was held at Lights, Motors, Action! I walked over there with the rest of the runDisney staff and waited for the runners to arrive. It was a pretty cool entrance. 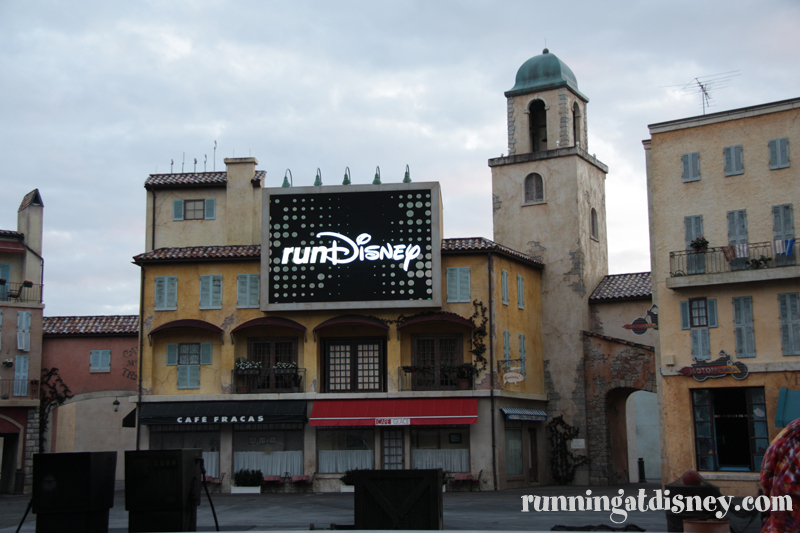 Earlier in the week, runDisney announced a new partnership with New Balance making them their official running shoe. 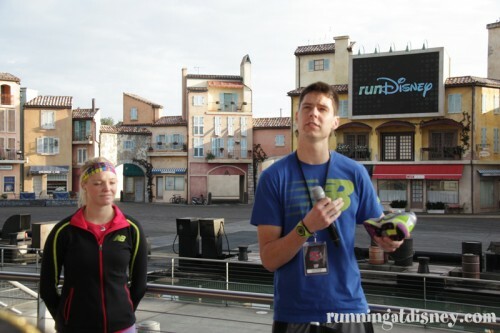 Members of the New Balance team were on hand to give us an overview on what to look for in a proper running shoes and the different varieties they have to offer. They also talked about what went into designing the new runDisney shoes that were available for a brief time at the Expo. Since this was the 20th Anniversary of the Walt Disney World Marathon, it was expected that there would be a few elite runners on hand. The expo had some amazing speakers lined up for that afternoon and I was excited to see many of them at the meet up. 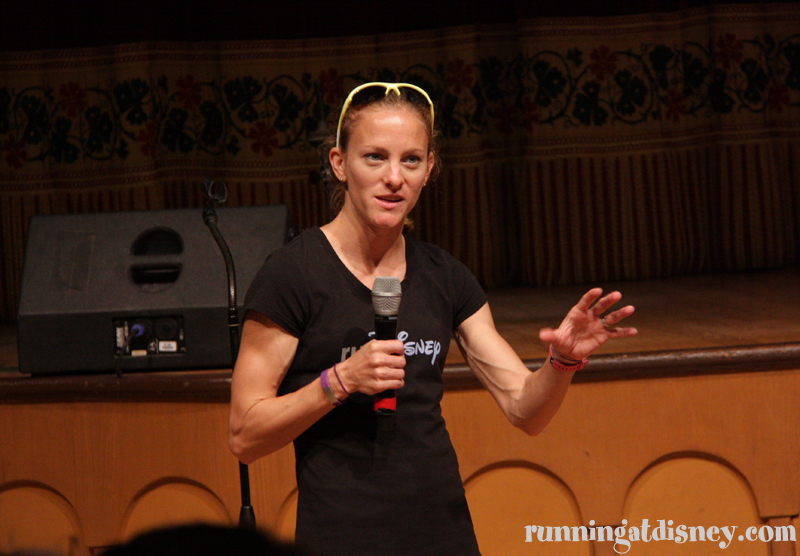 They offered some great tips for distance running and answered questions from the audience. Bart Yasso admitted that his favorite race costume was when he dressed up like a penguin for the Marathon du Medoc in France where there are 23 wine stops along the way. Now that’s my kind of marathon! Next up was former NFL linebacker Eddie Mason. He spoke about the importance of focusing on core strength to bring more balance to the body and how Cigna is leading this charge. Core strength is something many runners overlook, but can be just as important as getting those long runs in. 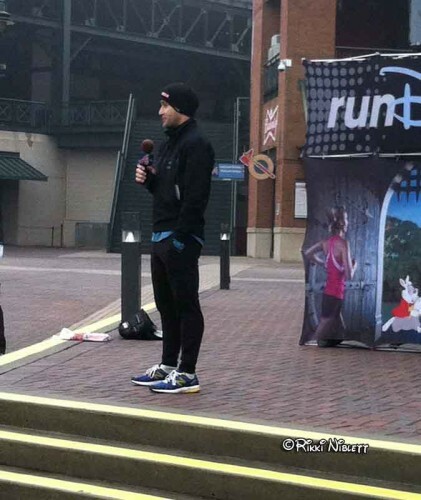 He also talked about how you need to listen to your body and rest if needed. You need to let your body heal in order to get stronger. Great tips! Our final speaker was Drew Carey who was supposed to run in the full marathon, but is recovering from a broken clavicle…ouch! 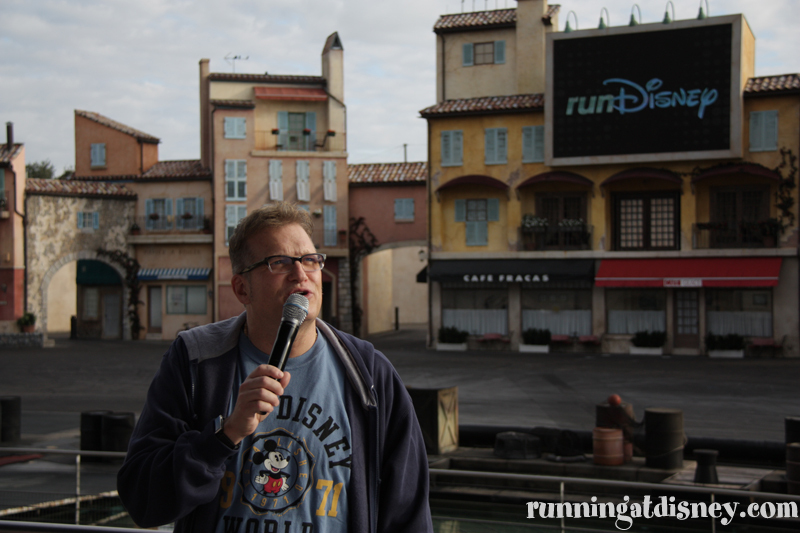 He told stories about his experience at the Disneyland Half Marathon, what really goes on at the Price is Right (spending WAY too much time on this topic!) and also admitted to hating Sounds Dangerous, the show he stars in at Disney’s Hollywood Studios. They really need to get rid of that already! Bob introduced one last special guest before the morning ended, Adriano Bastos. Bastos is a seven time winner of the Walt Disney World Marathon and was going for his 8th win this year. 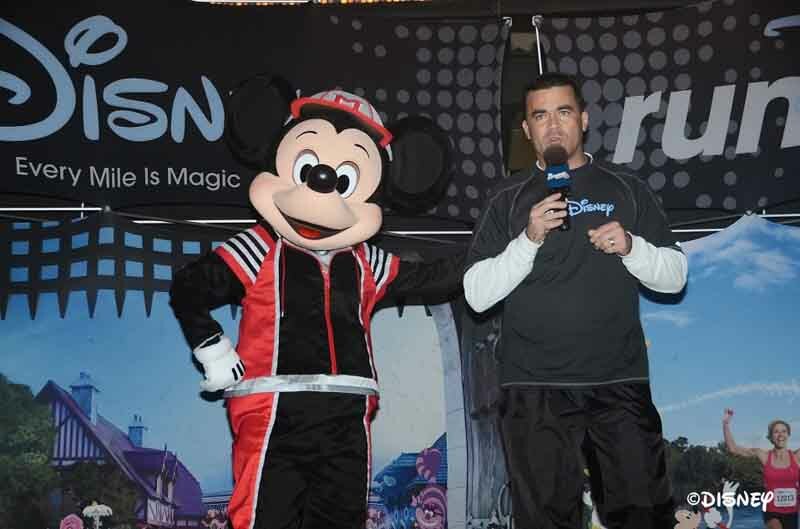 He adorned with numerous Disney tattoos and gets a new Mickey on his forearm for each race he has won. Very cool! 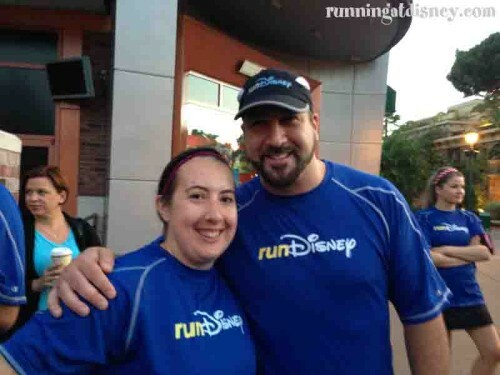 Joey Fatone & I are BFF! 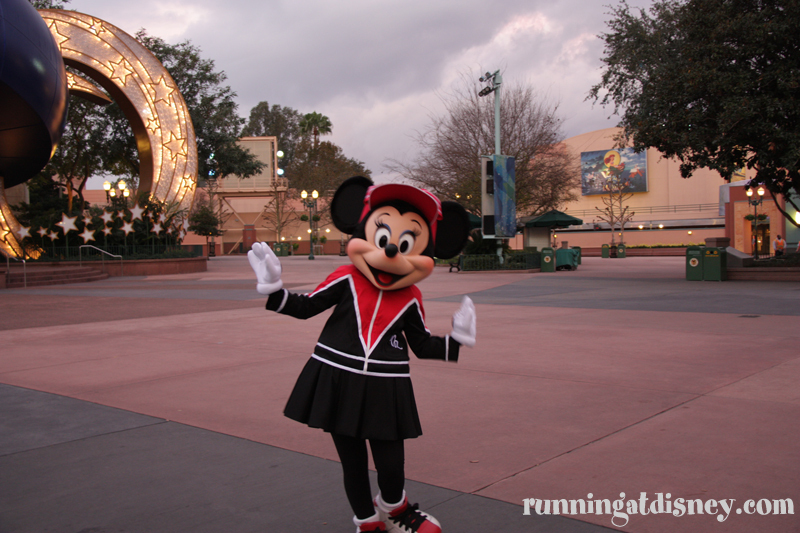 runDisney always puts on great events and this certainly did not disappoint. 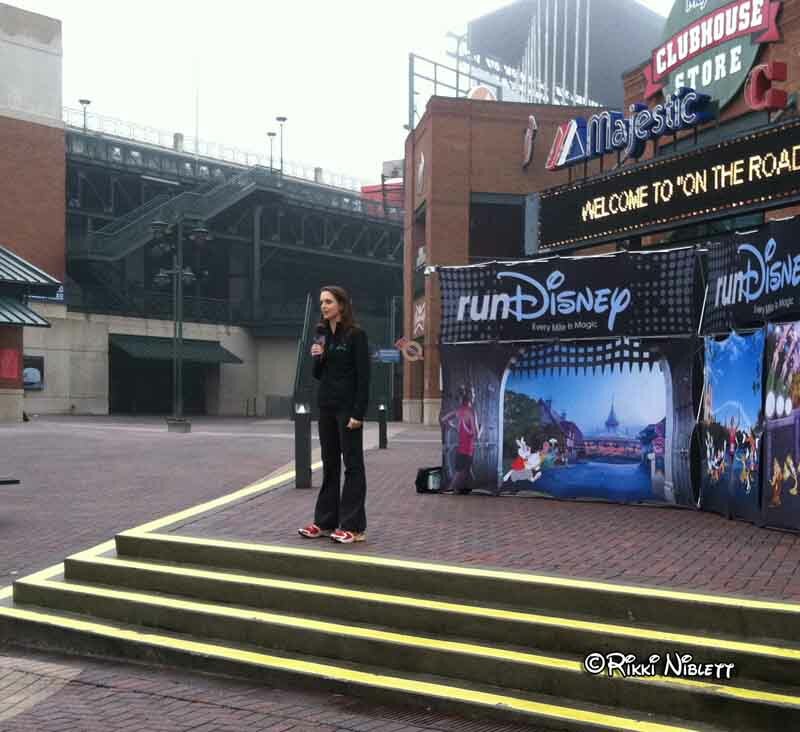 What a great way to kick off marathon weekend and get everyone excited for the big races ahead! 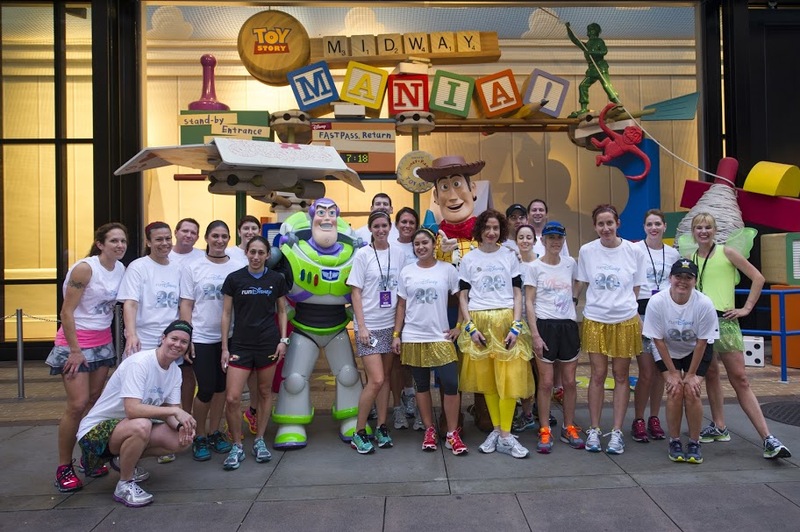 Who would you have been most excited to meet at the runDisney meet up?